Avial is a traditional Kerala dish. It is central to Malayali cuisine, has a recipe and at Malayali feasts, served on plantain leaves, occupies pride of place. In as much as it is recipe-based, avial is not a stickler for the same. It is seen as prepared from whatever vegetables you have in the kitchen. In colloquial Malayalam, something resembling avial also alludes to an element of disarray and absence of perfection. Arguably therefore, avial is life as it is. 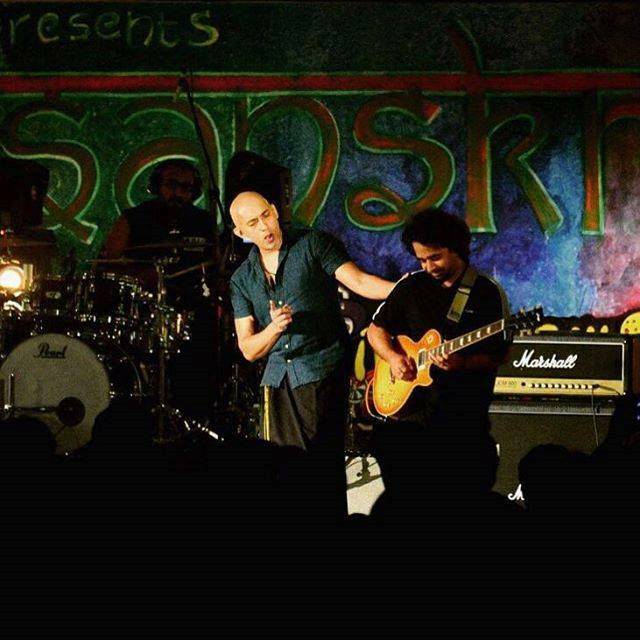 A night in Kolkata, sometime in 2009 or immediately thereafter, I realized that a rock band had transformed forever the link between music and my mother tongue. Almost a decade later, while visiting Kerala, I managed to meet the members of Avial. This article written from a fan’s point of view, attempts to explore the context which birthed Avial, the early years leading to their debut album, what their sound meant and what stands between them and a second album. With annual festivals dedicated to classical music, Thiruvananthapuram is unlikely home for rock. 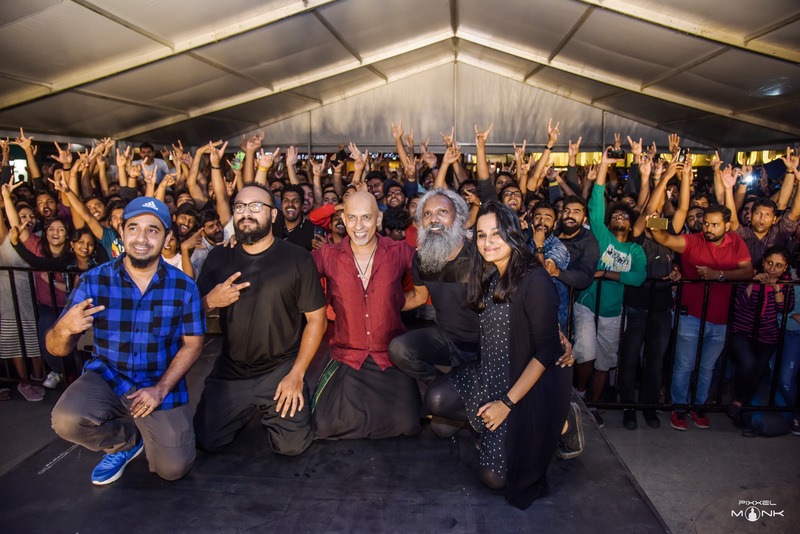 Cold shouldered locally and living as they did in a corner of India, removed from the musical scene of the metros – fans of alternative genres of music in Thiruvananthapuram had to stretch to access their fix. While many stayed content with rock acquired for the heck of being branded hip, some plunged into it seriously. A handful of rock’s followers thought of music as potential career. Bands mushroomed. High point was becoming regular, paid act at the five star-luxury hotel in Kovalam. Those not making it so settled for a hotel in town. Life wasn’t easy. “ I was lucky to come from a well to do family. Still my mother would sometimes jokingly say that while others worked and brought money home I was borrowing from her to keep my career alive,’’ Tony John said laughing. Compared to this Kochi was more happening place for western music. In the days of Tony’s school and college education, Kochi even had a famous band that cut an album – 13AD (the city would follow that up with another talented act – Motherjane). In retrospect, what everyone may have underestimated was the value of stretch. Who would have thought for instance, that one day, there would be a recording studio at Tony’s house in Thiruvananthapuram? The band Tony initially played with was called Karizma. They sang in English and performed covers of songs originally sung by well-known bands overseas. By 1996, it was disbanded. 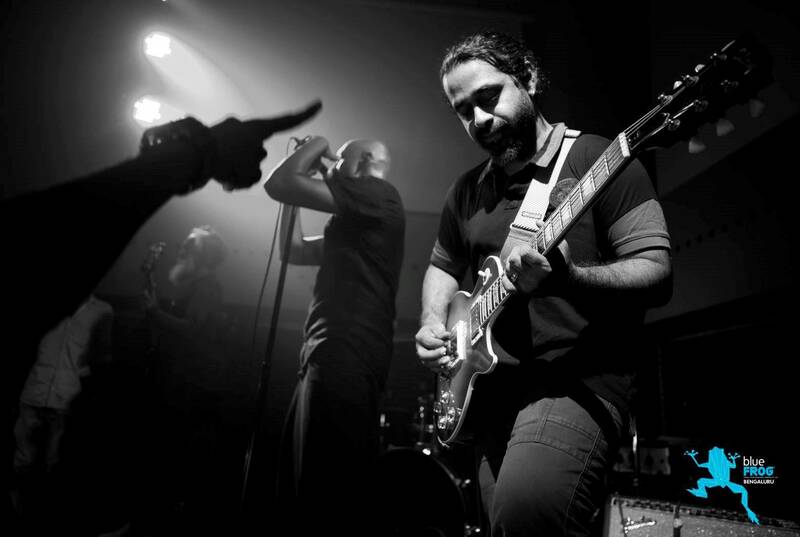 Soon after Karizma wound up, John P. Varkey who was the band’s guitarist, moved to Bengaluru. He played classical guitar there as part of a trio. In 2000-2001 some of the band members reunited under different circumstances. Now squeezed by the city and portions of it threatened by pollution, Vellayani, is a picturesque freshwater lake in Thiruvananthapuram. It is the sort of environment creative minds craving an element of solitude away from city, would drift to. Among those choosing the area around Vellayani for base, was the Daksha Sheth Dance Company. According to the group’s website, its mission is to create international quality performances by integrating contemporary dance with traditional movement art; theatrical design, innovative design, innovative sound and state of the art visuals. 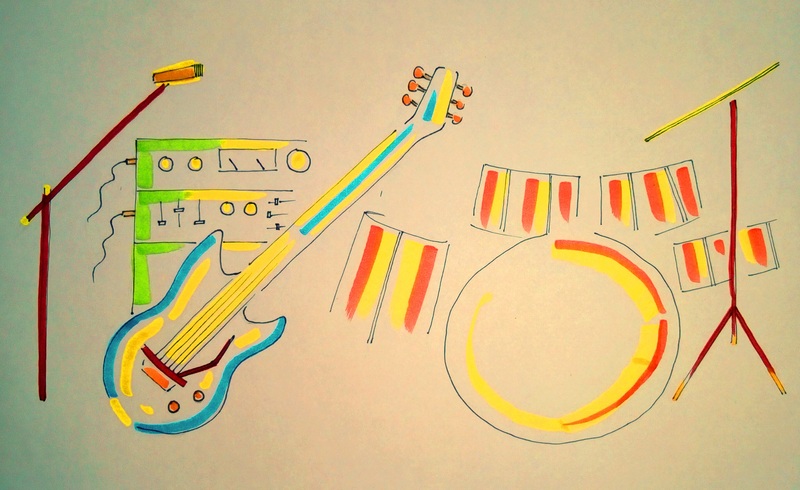 The dance company wanted a drum and guitar ensemble for one of its productions. In 2000-2001, this brought Tony and John to Vellayani. When John left for Sweden, Rex Vijayan stepped in. Sometime later, when John returned, Tony introduced Rex to him. Looking back, this coming together of the three musicians was the seed of Avial. Working with Daksha Sheth Dance Company, they got opportunity to travel abroad. “ The overseas trip was an eye opener. We realized that people were appreciative of original music, sung in one’s own language,’’ Tony said. 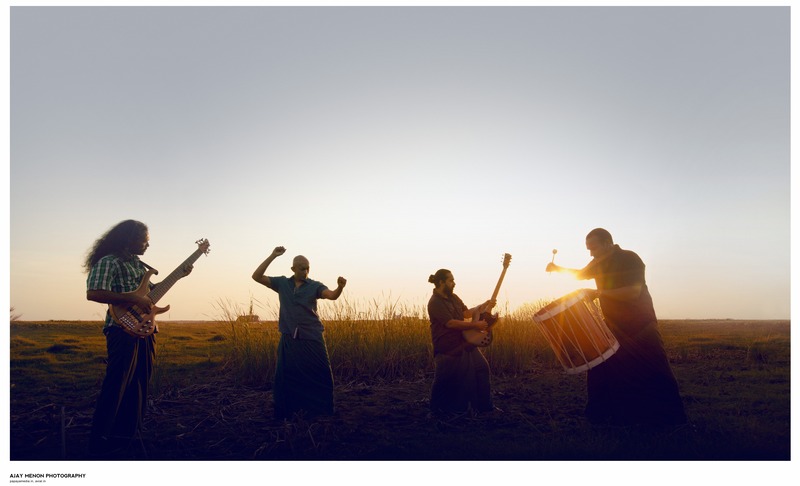 It was reason to reflect on the tradition of rock bands from Kerala singing in English. If you meditate on it, you will realize that a lot more goes into language than meets the eye. That’s why languages are different as are the styles in which they were originally shaped into song. “ Doing rock in Malayalam is not easy. You have to find the right word and sentence length,’’ Tony said. One of the bands John had been part of earlier was Jigsaw Puzzle. They brought out an album but it didn’t click. Among the songs Jigsaw Puzzle performed was Nada Nada. It was in Malayalam and felt like folk music. “ The use of local folk music in rock was John’s vision,’’ Rex said. Both Tony and Rex had heard Nada Nada before. They had been impressed by it. Pradeep Kallipurayath – according to Tony, he worked for SS Music (a TV channel) then – wished to feature the song on video. John tuned the song. As important as tune, is overall sound. For discerning bands, their sound is aural signature. “ Rex is an amazing music producer,’’ Tony said. Rex did the music arrangement for Nada Nada and Tony worked the turntable. The track was produced at the recording studio Tony had built at his house. The video accompanying the song was shot in Irinjalakkuda. It was subsequently released on SS Music. “ The response was amazing. Nobody knew Malayalam could be sung this way,’’ Tony said. Pradeep suggested that the band have a name. Rex came up with Avial. The name stuck. At this point Avial had all of one song. Rex was born and brought up in Kollam, 64 kilometers north of Thiruvananthapuram. His father Albert Vijayan worked as a music composer and arranger for the Malayalam film industry. His mother liked to sing. Born into a family given to music, Rex started off playing the piano. “ But I got bored,’’ he said an early evening at a cafe in Kochi. It was late September, less than ten days since I met Tony in Thiruvananthapuram. Bored of the piano, Rex taught himself how to play the guitar. He initially played in “ random hotel bands.’’ Then he joined Motherjane. Unknown to him, where he was heading for – the place that would spawn his best creativity yet – was a room in Tony’s house, that recording studio. Growing up in an environment filled with music, Rex was familiar with studios and recording technology. “ I started recording when I was in eighth standard,’’ he said. Rex is credited with creating the signature sound of Avial. It is a sound that is rich, wholesome and quirky. In times of bands choosing utterly polished aural signature and sometimes sounding flat as a result, Avial dared to go with a pulsating bass reminiscent of the psychedelia of the 1960s. “ We knew that as a generation born and alive in the period we belonged to, we had this ability to bridge a variety of aural signatures in music,’’ Tony said. While bass made the band’s music feel like a flow, the quirkiness was courtesy unconventional aural inputs providing a graffiti-like visual quality to Nada Nada. Once as band members and friends sat together, one of them – Reeba Paul – happened to make a phone call. Upon not getting through she spoke frustrated about the recorded message from the telephone exchange: you are in queue; please wait. It struck a chord. The sentence uttered by Reeba and textured to sound like the voice from the exchange, made it into Nada Nada; as did the call of a rooster. It is hard to intellectualize relevance for such audio inputs. The right word seems – quirky or as George Mallory is said to have quipped when asked why he wished to climb Everest: because it is there. Notwithstanding all these audio inputs, for Malayali listening to Nada Nada, the trigger to sit up and take notice was something else. For a year after the Nada Nada video appeared on SS Music and began making waves, Avial didn’t do much. Asked if there was any live performance of the song, Tony said, “ Maybe there was one. I recall a show in Kannur, where we sang one or two songs.’’ Then one of Tony’s friends gave money for the band to start work on an album. Encouraged, Rex who was then based in Kochi shifted to Thiruvananthapuram. For the next three and a half years, the band worked diligently on its album. Except for the final mastering, the rest of the recording work was done at Tony’s home. Rex had a room to stay there. “ When we stumbled on to something interesting, we went to the adjacent studio to record,’’ Rex said. The total number of songs worked upon across the three and a half years, was just eight. It betrays the amount of attention and work that went in as combination of music by band and further fiddling in the studio. “ I see the computer as another band member,’’ Rex said. They wished for sound signature capable of long shelf life. One of the interesting outcomes of this period was the creation of multiple versions of some of Avial’s songs. From them, the best versions were chosen. “ Throughout this work, our focus was not on the market. It was not on selling the music. It was to get the sound right,’’ Tony said. Among those who had provided music for the dance productions by Daksha Sheth Dance Company was Mumbai-based bass guitarist Naresh Kamath. 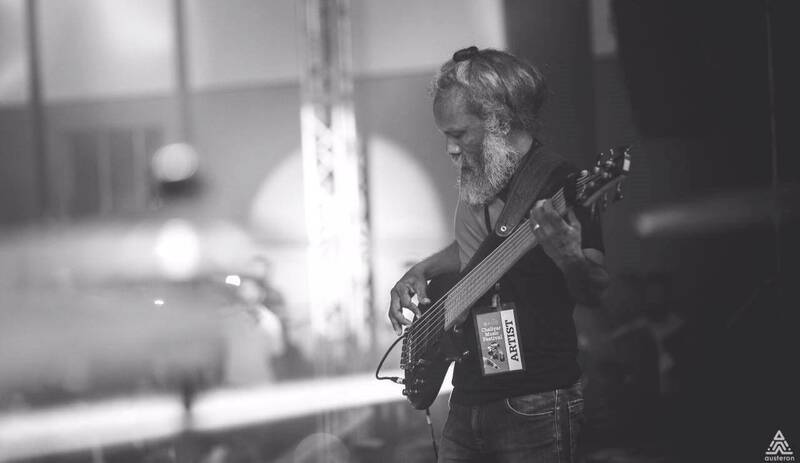 When Avial needed a good bass guitarist to play for the album, the band contacted Naresh. “ We sent him samples of what we had created and he was immediately interested,’’ Rex said. 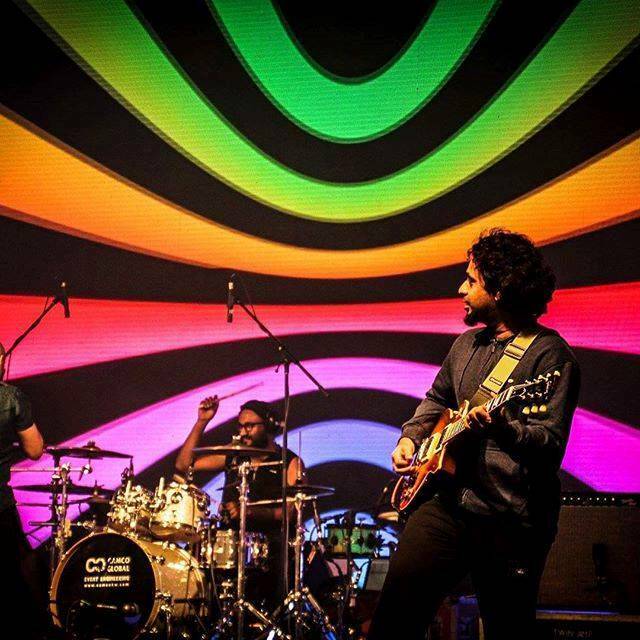 Naresh introduced the band to Phat Phish Records, a music company operating from Mumbai. The final mastering of the eight songs was done in Mumbai. Phat Phish also brought out a video of Nada Nada; the song as featured in that video is probably its most popular version. In 2009, music label EMI brought out a compilation of rock songs by Indian bands. The CD was called India Rocks. The first volume was released in 2009; the playlist included Nada Nada. Around this time, freelance journalist was at Music World in Kolkata, looking for CDs of Bengali rock, when the salesman recommended India Rocks as well. That night before sleeping I listened to the album on my portable CD player and was stunned by Nada Nada. For Malayalis fond of rock and other genres of western music like blues and folk (freelance journalist among them), there had always been a major gap in the local style of singing. Popular Malayalam music was trapped in compulsion to endorse social order. Melody was important and melody in turn, was usually based on Indian classical and devotional music. Either way, the songs got lauded for their structure, lyrics and delivery but stayed limited in their capacity to convey variety in human emotion especially when juxtaposed on vastly changed times. Visceral connection was absent. On the other hand in blues for instance, the rawness of human emotion – sorrow, anger – all these are captured in an idiom that is definitely the stuff of music but is content not to be classical or distanced from singer / listener. It links directly. In western music, blues has lent itself well to rock, as did folk. Both Tony and Rex said that discussion on what Avial’s idiom means is beyond them. 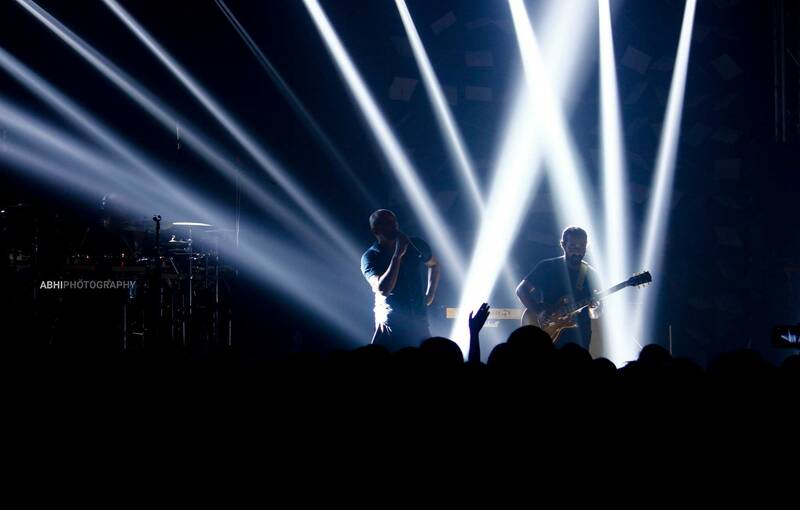 They navigated their way through the band’s first album with music and sound signature as compass. They hadn’t imagined any of what people (freelance journalist included) read into their work. I could not find a clear response from them describing the band’s sound; it appeared the stuff of exploring and discovering using sounds already heard as reference points. Among external influences, both Tony and Rex said that band members had been fans of Linkin Park. Having mentioned Linkin Park, Rex thought some more and added Incubus and Pearl Jam. Back in time, motive if any appeared confined to finding a solution for the limited audience English rock music fetched in Kerala. As musicians loving the genre, they wanted to break out of such restricted appeal. Singing in Malayalam had seemed potential answer. What made Malayalam click in rock was folk. Resonant of bygone times and rich in its interplay with nature, Malayalam folk music can be soulful. Yet in hindsight, one would argue that even Malayalam folk songs – so capable of conveying sorrow, sense of loss and angst – fall short of the total bandwidth of emotions contemporary urban lifestyle, consumerism, globalization et al unleash. But what if, folk and rock joined hands? That was the brilliance in John P. Varkey’s vision. He was based in Thrissur, a little over 80 kilometers north of Kochi and some 280 kilometers north of Thiruvananthapuram. For folk song, John got in touch with an upcoming lyricist. Engandiyur is a village in the Chavakkad taluk of Thrissur. Engandiyoor Chandrasekharan is a writer and lyricist hailing from this place. According to a 2012 article on him in The Hindu newspaper, his studies discontinued after class 10, Chandrasekharan went into his family business of making furniture and wooden sculptures. What fascinated him however was literature and acting. In the article, he says of his writing style, “ I use ordinary language. I write what I understand. That’s why people like them.’’ John asked Chandrasekharan to write some songs in Malayalam, which Jigsaw Puzzle could sing. “ He told me to write as I wished. There was no brief in terms of subject,’’ Chandrasekharan told this blog, mid-October 2018. Nada Nada was one of the songs Chandrasekharan penned so. “ I imagined it as a journey; you walk seeing many things,’’ he said. Tuned by John and powered by Avial’s rock music the song exploded to being an anthem. “ I didn’t expect such popular affection for that song. What happened just amazed me,’’ Chandrasekharan said. Nada Nada and Avial changed his life. Once a writer of lyrics for small films, he is now an established lyricist in the Malayalam film industry. What we haven’t mentioned yet in Avial’s brew, is the significance of voice. According to Rex, Anandraj Benjamin Paul grew up overseas. The two met when Rex joined a band called Overdrive. “ In real life I don’t think Anandraj can read and write Malayalam,’’ Rex said. It offers insight into not just Avial’s unique predicament in Malayalam rock but also what the idea of being Keralite means these days of globalization and diaspora. Anandraj’s raspy rendition of Chandrasekharan’s folksy lyrics was the blues connection long missed in Malayalam songs. 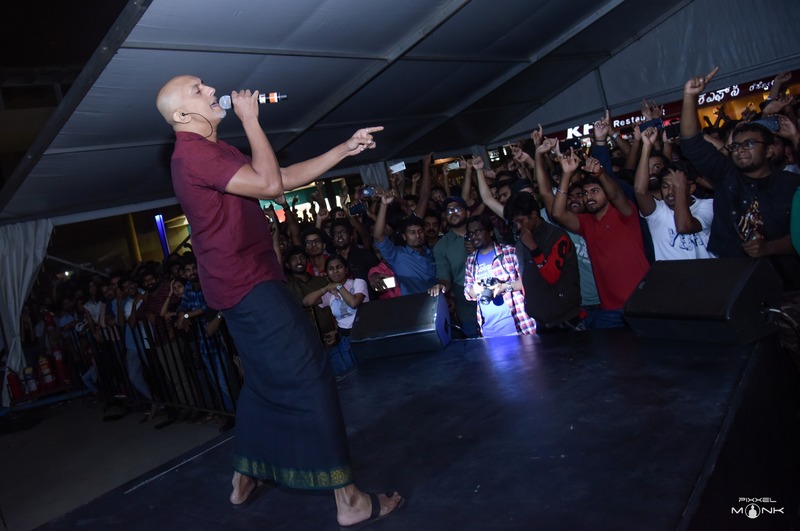 It confidently, almost defiantly took on popular perceptions of vocalization in Malayalam music and inspired the imagery of anyone singing their heart out. It removed intermediary inhabiting space between feeling and singing. That night in Kolkata, I felt exactly what Tony would tell me almost a decade later: nobody knew Malayalam could be sung this way. Adding to overall impression was freight train of a band in the background. Interestingly, despite one of Avial’s strengths seeming the skilled craftsmanship of its musicians, Rex said, “ we are not a band of exceptional musicians.’’ Posted on YouTube, viewers from across the world have sometimes commented below their videos that they don’t understand a word of what is being sung but the music is excellent. Like all genres of music, rock too is an interpretation. The late G Aravindan was one of Kerala’s most respected film makers. In 1979, he made a film for children called Kummatty. It won that year’s state award for best children’s film. The music for the film was composed by M.G. Radhakrishnan. Kavalam Narayana Panicker wrote the lyrics; he also sang them. A memorable song from the film was Karukare Kaarmukil. Aravindan wasn’t a maker of mainstream, commercial films. His films were realistic and belonged more to the parallel movement in Indian cinema. The song in question was meant to accompany scenes of dark monsoon clouds and approaching rain. According to Kavalam Sreekumar, Narayana Panicker’s son and a well-known singer in his own right, the song was based on Samantha Malahari raga, which in turn finds prominence in Kerala’s tradition of classical music called Sopana Sangeetham. This tradition which developed in the state’s temples has distinct ragas and also ragas commonly used in South Indian Carnatic music. Sopanam – Wikipedia describes it as “ a happy blending of Vedic, folk and tribal music’’ – shares a similarity with Hindustani classical music in that both traditions have ragas meant for singing at particular times of the day. Malahari is a Carnatic morning raga capable of providing a sense of calm. It is associated with the rainy season. Narayana Panicker wrote the lyrics of Karukare Karmukil with Samantha Malahari in mind; M G Radhakrishnan tuned it. Tony had a friend from Kottayam with whom he used to jam. The friend had a habit of singing Karukare Karmukil from Kummatty. Its haunting melody and folk flavor caught the band’s interest. Rex was hearing the song for the first time. “ I remember waking up next morning with that melody still in mind,’’ he said. Intrigued, the band proceeded to work on a version. The friend who sang the song had sung it slow. The slow pace remained tempo for Avial’s interpretation of the work by Kavalam Narayana Panicker and M. G. Radhakrishnan, both acknowledged masters in their space. “ Played slow and with rock elements added, the song acquired the feel of grunge rock. Had it been played faster at its original pace, I suspect that within rock, it may have sounded clichéd. It may have ended up just another rock and roll song,’’ Rex said. Crucially, aside from slowing the tempo, the band maintained the song’s melody. “ I don’t think I have heard another melody like that,’’ Rex said. The resultant Karukare has stayed a fine example of Avial’s creativity. Even as the music arrangement is powerfully alternate rock and electronic, it retains the tenderness and mischievous tenor of the original. It broadly retains the original tune, uses rock music in a measured way (it is a song with moments of high decibel music and fade to quietness) and also manages to create the atmospherics of gathering rain, a vignette of existence that is typical Kerala. For purists, it probably remains debatable whether rock is apt format to showcase the devotion and melody associated with Sopanam. Sreekumar said that his father always welcomed creativity and considered Avial’s interpretation as another version. “ I think the underlying reality is that it is a simple, beautiful song. As long as you stay loyal to the melody, it remains beautiful no matter what the style you sing it in,’’ Sreekumar said. Indeed one of the significant aspects of Karukare is sense of unchanged melody – like a slice of timeless old – with rock building a brooding, contemporary envelope around it. Any which way you look at it, it is fantastic recipe. In 2008, Avial’s first album – named after the band – was released to critical acclaim. “ Even though we started off with Nada Nada, the main element was the album. Songs like Chekele, Aadu Pambe, Ettam Pattu – they played a huge role. We started performing because of the album,’’ Rex said. As with all bands, behind the scenes, there were losses. John left quite early in the production process. Then just ahead of the album’s launch, Anandraj moved to the US. Tony, who had until then sung back-up, took over the lead vocals for the band’s live performances that followed. But he knew Anandraj set the bar pretty high. 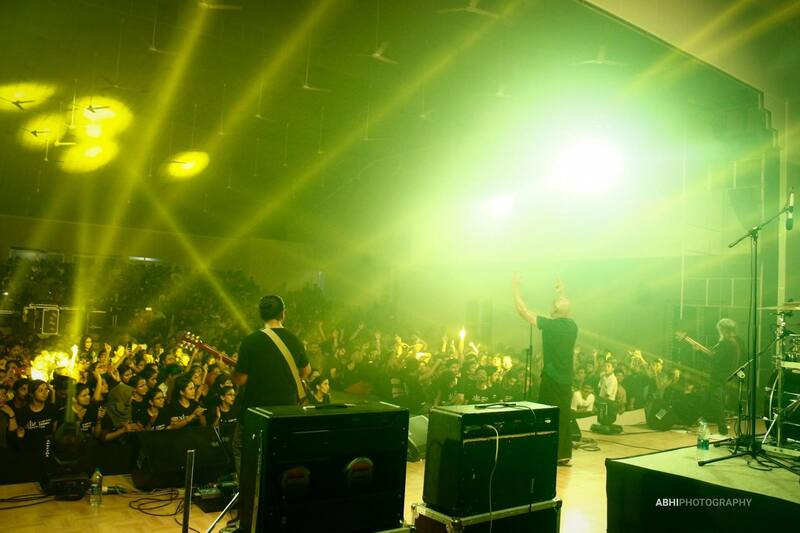 The band’s first live performance post album-launch was at Eastwind music festival in Delhi. 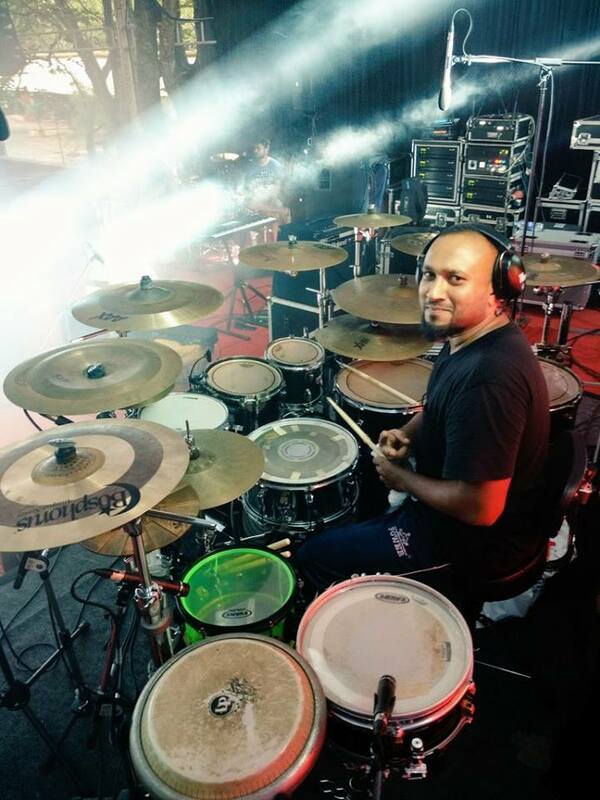 It was also drummer, Mithun Puthanveetil’s first show with the band. At Vazhuthacaud in Thiruvananthapuram are two bungalows long familiar to the public as official residence of ministers. In one of them, on the first floor, was an old, weather beaten bass drum, which had followed its owner around, a reminder of his early days in music. Rooms nearby represented the other end of the journey – they had fully kitted out drum sets, equipment for programming and old cymbals, cracked and broken, retained by artiste to add variety in sound. At the time of writing, Mithun’s father, Kadannappalli Ramachandran, was a minister in Kerala’s government. Mithun’s mother liked to sing; the family loved music. The old drum had been acquired years ago, when a young Mithun became obsessed with a drum set he saw at a shop in Kottayam. At his father’s request, the shopkeeper sold Mithun a cheap drum he had in stock. It had no pedals, hi-hat or cymbals; Mithun had to improvise all that. “ I like seeing an array of drums before me,’’ he said. Mostly self-taught, he however had one teacher he met at Kochi and owes much to – Mathew Joy. By around the time Avial was readying their first album, Mithun had become drummer for the Thiruvananthapuram based-metal band, Rage. Although drumming for a metal band, Mithun’s natural inclination was towards genres like funk and jazz. 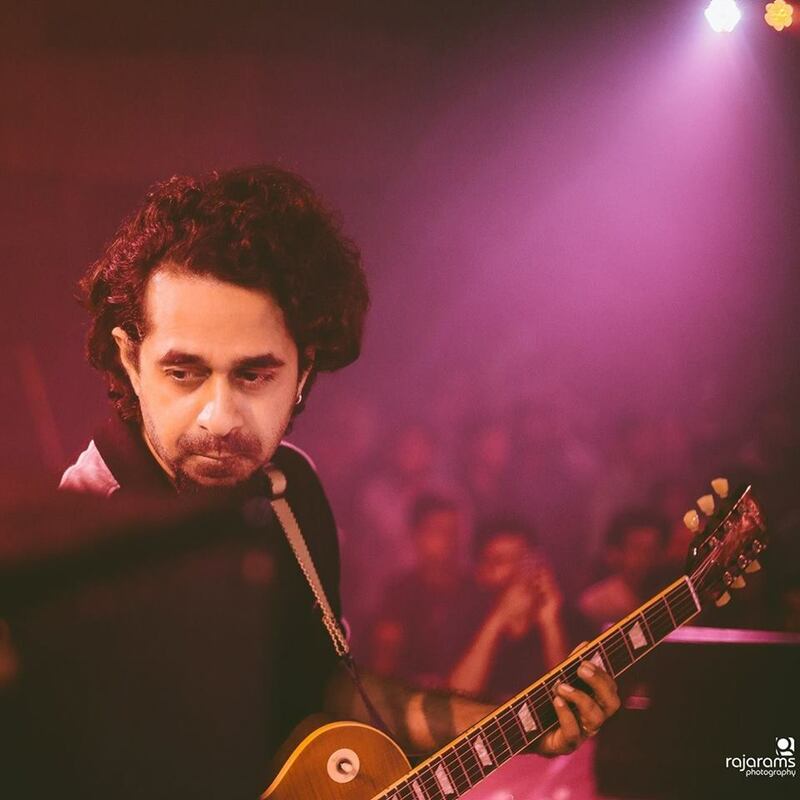 Nithin Vijayanath – then guitarist for Rage – was Rex’s friend; Rex used to help the band with music arrangement and mixing. Rage kept a practice room near Keshavadasapuram in the city. Mithun fondly remembered a jam session with Rex (he was on bass) there as first hint of potential chemistry. Among those leaving Avial after work on the first album concluded, was their drummer – C.I. Joffy. Mithun stepped in to fill the gap. The jam session in the practice room was arguably the second turning point in Mithun’s journey in music. The first had been his introduction to western pop music as a kid; he recalls touching the speakers of his National Panasonic audio player and feeling the pulsating rhythm. During his childhood at Iringal near Vatakara and later years in Kannur (including his earliest bands), Mithun’s intake of music had been eclectic – there was Malayalam, Tamil, Hindi and English. Avial’s rock – sung in Malayalam – resembled best of both worlds. There was the rhythm from those speakers and the language he was born to. Naresh also left Avial; he has since been replaced by Benjamin (Binny) Isaac. An accomplished bass player who has played with several bands and musicians / singers from the film industry, Binny is Avial’s oldest band member in terms of age. He spent his early years in Thiruvananthapuram, where working with his church choir introduced him to classical guitar and piano. His two brothers were award winning classical guitarists in their college days. Guitar and keyboard available at home, meant ability to train diligently. For lay music listeners like this writer, bass would seem challenging because its trajectory runs distinctly apart from progression of melody. “ For me transition to bass was relatively easy because classical guitar entails playing melody and bass at once. I was already used to the technique required,’’ Binny said. In 1986, around the same time he started playing bass, Binny’s family shifted to Kochi. Ten years later – in 1997 – he joined his first rock band called Nine Hours. They sang at a hotel in Thiruvananthapuram. According to Binny, these years saw quite a few musicians and singers from Thrissur play with bands elsewhere in Kerala, including in Thiruvananthapuram. There were also youngsters who had picked up western music in the Middle East, shifting to Kerala. It was a period of churn. From Nine Hours, Binny moved to Overdrive, a classic rock band which had in its fold Anandraj and Joffi (as mentioned earlier, Rex too had a stint with them). They played at the luxury resort in Kovalam. Binny was thus known pretty early to the talent that would converge as Avial. When Nada Nada made its debut as a single, Binny was still with Overdrive. Having known John, Tony, Rex, Anandraj and others, he had an inkling of what musical idiom lay in store. He liked what he heard. “ It was an experiment. I don’t think anyone did it as well as Avial did. The song was distinctly rock. It was also distinctly Malayalam. Anandraj’s style of singing played a role in ensuring that,” Binny said. When Naresh got busy with his own work in Mumbai, the band asked if Binny would step in as replacement. His first live performance with Avial was in 2008-2009 in Mauritius and Reunion Island. Although critically acclaimed, Avial enjoyed a mixed bag of commercial success. The band’s debut album produced by Phat Phish was to be distributed by Sony BMG. According to Tony, the album sold some 50,000 copies. But following disagreement between Phat Phish and Song BMG, distribution too was done by Phat Phish; that may have limited the album’s reach. Aside from initial signing amount received, the band got no royalties. “ Phat Phish folded up later,’’ he said. The main source of revenue for the band has been live performances. In that market, they remain among the better paid acts. But given to singing original songs, their repertoire of work is limited – about 14 songs. It is enough to perform on stage but probably not enough when imagined as band’s lifetime work. What is remarkable is how some of these songs continue to be heard by fans. By 2018, Nada Nada for instance, was almost 15 years old. The song remains Malayalam rock’s ambassador to the world. About three years ago, Avial was featured on BBC. Ettam Pattu and Aadu Pambe were played on BBC Radio, Tony said. In Kerala there are still those who refer to Avial’s music as `fusion.’ That is cavalier. The best approach is to call them a rock band and their work as rock or plain, music. One reason I pitch description so is that from vocals to their sound in rock, the Avial package has been more wholesome and committed to genre than later entrants into the same space. There isn’t any pleasing the market, in Avial’s work. The studio may have played a big role in shaping Avial’s sound but the band made no effort to sound sweet. Neither Tony nor Rex could describe accurately how the band’s sound or that creative drive behind the first album evolved. The indescribability of those times is one of the concerns playing in their minds as they contemplate a second album. They may have succeeded in recreating the atmospherics of rain for Karukare but can they recreate the madness which made them a band in the first place and fueled them to one hell of a debut album? The period preceding Nada Nada and their debut album had been a very unsure stage in the careers of band members. Avial was a cathartic release born from that. “ What keeps us going is our passion. You can’t force creativity,’’ Tony said thoughtfully. Both lead vocalist and guitarist concurred that the band’s preferred idiom would continue to be rock and folk. “ Going ahead, the only thing to worry about our music is whether we like it or not. We are that sort of people who get bored of our own music,’’ Rex said. On my visit to Kerala, 6+6 was often reason for happiness. Will it stay so? I don’t know. I hope it does for it reminded of common sense in fashionably expensive times. From the highway as we turned into the road leading to the South Kerala tourist attraction, the ambiance changed; distinctly. The surroundings were shaded, temperate and green. The road we were on was unlike any other I had seen in these parts. It was well maintained with a proper footpath guarded by steel railing. Refined as it seemed, the atmosphere was also synthetic. Not that the mess of everyday Kerala is inspiring; just that you know an island of deliberately developed property when you see one. For some reason the first thing I thought of as we beheld this place was Jurassic Park. The impression was strengthened when a posse of muscular men, clad in tight T-shirt and cargo pants, walkie-talkie in hand, waved down our autorickshaw at a junction ahead. “ Do you have tickets? It is booked online,’’ one of them said. Behind the guards and the access they regulated were the lower slopes of a hill with a huge rock on top. To be honest, the welcome had felt tad aggressive. But then gated properties are valued exactly for that. If you take away the barricades to entry, the exclusivity craved by those frequenting it, is lost. Degradation also happens faster when whole world goes in. There is an alternative. You can start at school level and teach every generation to tread light on nature, preserve beauty and appreciate solitude. That is however longer haul. Who has patience for it? Certainly not, when schools and colleges are factories in service of successful career. Given we hadn’t booked tickets online, we were politely guided to ticket booths nearby. A young man offered assistance. It seemed a junction waiting for business. All eyes were on us. Now both my cousin Rajeev and I like to walk. Our idea of coming to this large rock, which everyone praised for a big bird sculpture recently installed there, was to walk around, eventually reach its top and enjoy the view. Although growing up in Thiruvananthapuram, we had never visited this rock earlier. In our fifties, we wished to catch up on what we had missed. At the ticket booth we sought price. Ticket price nudging Rs 500 and a strict no to going up the rock along old paths or newly created ones (you had to compulsorily take a short cable car ride) ended our original mission. Something about the whole affair – perhaps the ticket rate, the guards and the packaging of outdoors and adventure as spectacle – put us off. We decided instead to walk along the road, see where it takes us. Hopefully it went all around the rock’s perimeter offering us a glimpse of structures on top and lets us enjoy the idea of being free, devoid of boundaries and guards. At some point on that winding road, we met a local resident parking his scooter before his house. Behind the building set in plantation like-ambiance, the rock loomed large. We chatted for some time about the rock that had now become a tourism project. We asked him if he had been on top and if so how it felt. “ Long time back it used to be our backyard and we would go there. The rock’s top is vast. The view from there is really nice. Now we also have to buy tickets,’’ he said laughing. According to him, all the planned services and attractions were yet to be in place. When they are, there will of course be a cost to experience them. “ What they are planning is supposed to be really good,’’ he said. We left it there. Staged stuff wasn’t our cup of tea. The walk around the rock was relaxing. We imagined early morning hours and decided it was a promising place to run. About half of the distance to walk was on the well maintained road with paved footpath. It connected to a bigger road leading to the local bus depot some kilometers away. Here the traffic rose. From a curve on this road, we saw a temple like-structure on top of the big rock. If I was reminded earlier of Jurassic Park, now I was reminded of the movie, Bahubali. I liked Jurassic Park for bringing dinosaurs to life convincingly. But like the Jaws franchise and its dilemma of how much shark it takes to scare audience progressively losing their fear, it tired pretty soon. As for Bahubali, neither of the two films interested me; I saw them on night buses plying the Mumbai-Bengaluru route, breathing a sigh of relief when kings, queens and heirs concluded their fantasy and Volvo returned to being quiet. Somehow, in these years of decadence by human numbers, excess and vanity, larger than life isn’t an engaging paradigm for me anymore. On the other hand, smaller than life, quieter than life – they attract. An hour – maybe hour and a half – later, we walked into Chadayamangalam’s bus depot, bought a glass of tea each along with dal vada from a nearby tea shop and sat down to savor it. We looked up from our glass and there, clear and free for all to see, was the bird atop the rock. It was without doubt an impressive sight. I don’t know if its destiny will be the same as Jurassic Park’s dinosaurs but this I know – for centuries that rock, just as it is, had existed brewing fascination. The question is therefore legitimate – what counts more, nature as it is or what we do to it? After the walk, the hot tea and vada felt good. Where we sat probably added to the feeling – we were seated on a large concrete block; tea shop counter behind us, bus depot in front, busy road to the side, people around, all of that open to sky and rock in the distance. It was the abject opposite of being larger than life. You were nobody. That was when I discovered a wonderful formula in the neighborhood. The glass of tea we were having – a full big glass, not the cutting measure of North India – cost six rupees, significantly less than Mumbai’s cutting chai. The vada cost six rupees too. In fact, according to the tea shop owner, there were other snacks to choose from as well and any of that had with tea, sold for six rupees a piece. Yet again, not the tiny portions sold for double the cost in northern cities; these were decently sized specimens. Chai and kadi (something to munch) – the combination sold for Rs 12. It satisfied my soul. Two days later in Thiruvananthapuram, I was treated to same formula at a small hotel near Vellayambalam; 6+6, no matter what snack from the designated lot you had full glass of tea with. The formula repeated again at the city’s East Fort bus stand. It was nice to see small tea shops defying market trends even as big projects succumbed. I sincerely hope some aspects of Malayali sensibility don’t change. A school to train aspirants, a shop to buy good quality gear, a festival that brings the best in the sport to India – this is a model to grow kayaking imagined from landlocked Bengaluru. It appears to have worked well. “ In India, Bengaluru has the highest number of recreational kayakers,’’ Manik Taneja said. Traditionally Ladakh, Himachal Pradesh, Uttarakhand and other places along the Himalaya, have dominated river rafting and kayaking in the country. Kayakers are more in these parts. They do kayaking for livelihood. Bengaluru in contrast, has a growing number of recreational kayakers pursuing the sport as hobby. Landlocked and located at the southern end of the Deccan plateau, some 2300 kilometers away from the Himalaya, the city is an unlikely magnet for the sport. The sea is a few hundred kilometers away and while rivers for kayaking take anywhere from four to six hours to access; none of them strike imagery in the head as grand as those from the north do. It was late August, 2018. We were at Manik’s house in Bengaluru. Aside from sporadic showers there was little in the city for sign of what monsoon had unleashed further to the south west. The floods of Kerala were just over 10 days old. Manik is among names you turn to for kayaking. Born in Dehradun, he grew up in Pune. During his school days, he was into sports and athletics; later he played hockey all the way up to league level. He graduated in computer science and took his masters abroad, in Amsterdam. 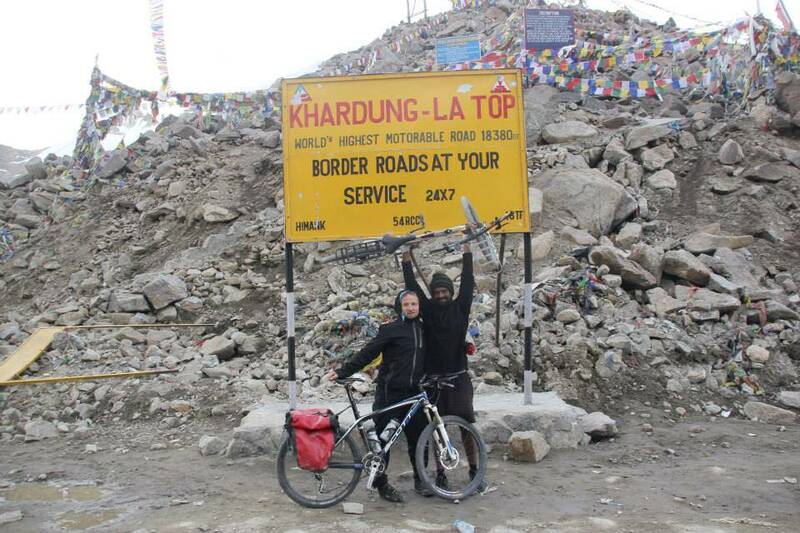 Following his masters course, Manik went on a small bicycle tour in Ladakh. Soon after this, he did a three day rafting trip in Uttarakhand’s Alaknanda River. The latter, he did with the well-known adventure travel company, Aquaterra. 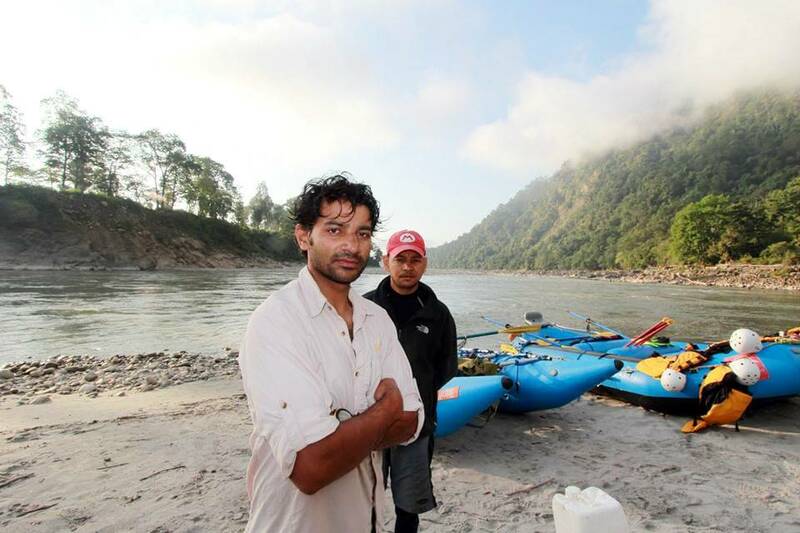 The rafting trip was led by Anvesh Singh Thapa, an experienced river guide. The two became good friends. The trip was Manik’s first exposure to kayaking. 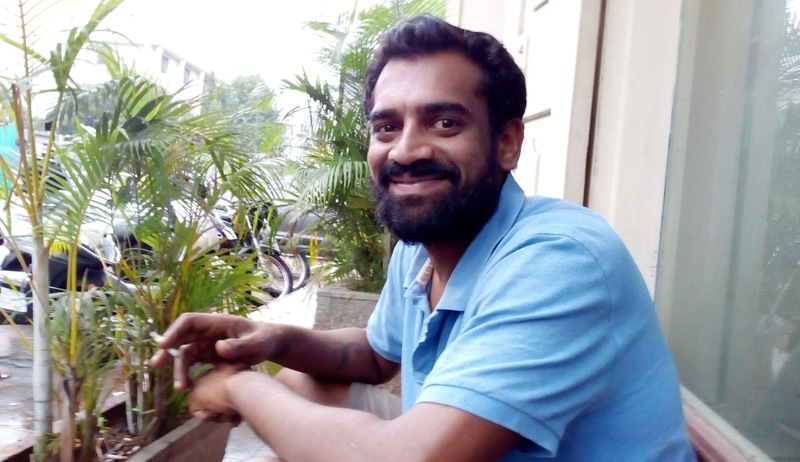 Upon securing a job back in Pune, Manik drifted into work. Sports receded to being strictly recreational. However as disposable income rose, he got back to the outdoors. When Anvesh commenced his own river rafting company (Expeditions India), he asked Manik if he would like to sign up for a rafting trip. Instead, Manik asked him to teach him how to kayak. Anvesh put together a training program. Five people registered. Only Manik showed up. “ That’s how my journey in kayaking started,’’ he said. It wasn’t easy. To the lay observer, kayaking seems simple. You sit in a boat and paddle. According to Manik, learning to kayak requires patience. For instance, the type of balancing kayaking demands is different from the regular type of balancing people are used to. For most people, the popular image of balancing is riding a bicycle. That is typically done on a flat, stable surface, at worst on surface where unevenness can be anticipated in advance. Unlike land, water is dynamic. A turbulent river – on which whitewater kayaking is done – is even more so. The closest a cyclist can come to whitewater kayaker’s predicament is in downhill biking, where the pace is fast and the going, constantly dynamic. 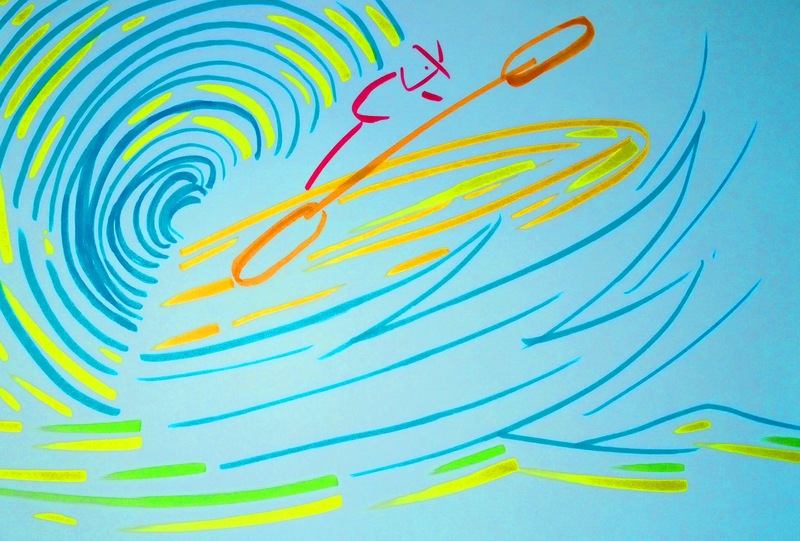 If you wish to be a good kayaker you have to be mentally ready for dynamic medium. Then, there are the details – the techniques of the sport. “ For newcomer to kayaking, the scariest part is getting flipped upside down,’’ Manik said. Legs placed well into kayak and the chamber sealed, instinct is to use one’s free torso to get back up. It takes a while to understand that the roll is done applying momentum to the lower half of one’s body. Executing the roll properly is merely beginning. It takes longer to keep ones cool and be good at doing the roll in all circumstances – rapids included. “ You have to keep your wits about you. Women tend to do better at kayaking. Men try to power through everything. You have to contain panic, slow down your mind, remember the techniques you learnt and execute them,’’ Manik said. Within the world of water sports, Manik believes kayaking is more individualist than say, river rafting, which showcases team work. He finished the introductory program Anvesh designed but on return to Bengaluru found himself as high and dry in kayaking as the city itself was in South India’s geography. Every time Manik wanted to kayak in white water, he had to haul himself to Rishikesh via Delhi. It wasn’t an efficient situation to be in. The mountains and rivers of North India are bigger than those of the south. Despite this, river rafting and kayaking had presence in pockets of South India. It was of modest scale. Naveen Shetty now runs a company in the adventure travel space. 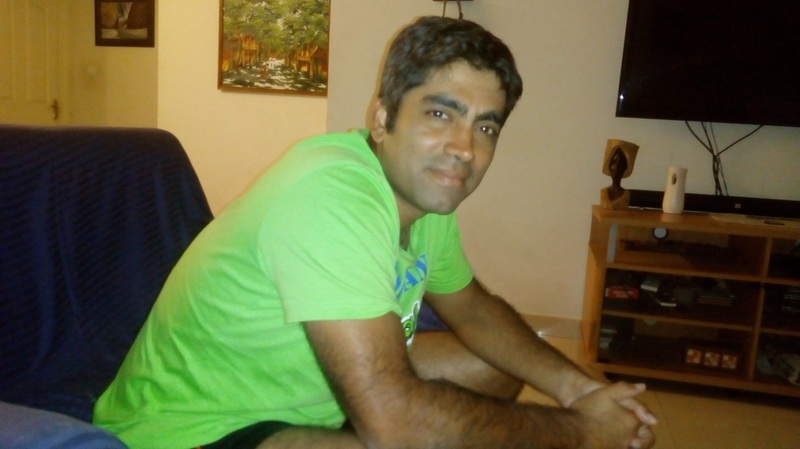 Originally a software engineer, he got hooked to kayaking after a couple of commercial river rafting trips in Karnataka. The connection he felt with this new experience was so strong that Naveen and his friends did not hesitate to buy inflatable kayaks, which they had to import. “ We invested in four or five kayaks, for ourselves and to also take anyone else interested, along,’’ Naveen said. Problem was – the potential for kayaking hadn’t been properly explored in South India. There were paddlers in Bengaluru; most of them frequented lakes in the vicinity of the city. 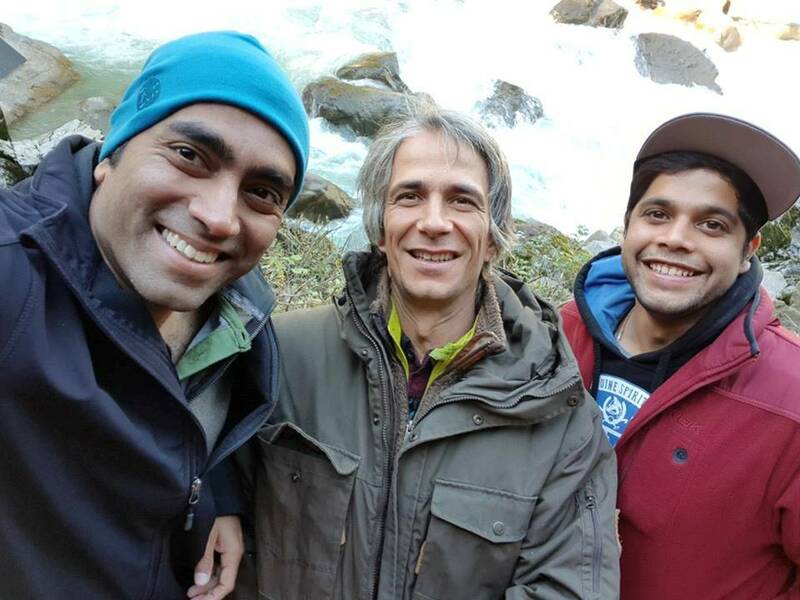 Around this time – early 2008 – Sohan Pavuluri, having spent eight years in the US, picked up whitewater kayaking over there and since shifted to Bengaluru, was looking for a local community of kayakers. That put Naveen and him in the same boat. “ I came across this website called Dreamroutes. While mostly dealing with activities like trekking, it had a section meant for paddlers,’’ Naveen said. The forum on kayaking at the website was started by Sohan and administered by him for a few months. The two – and interested others – agreed to meet up at one of Bengaluru’s lakes. 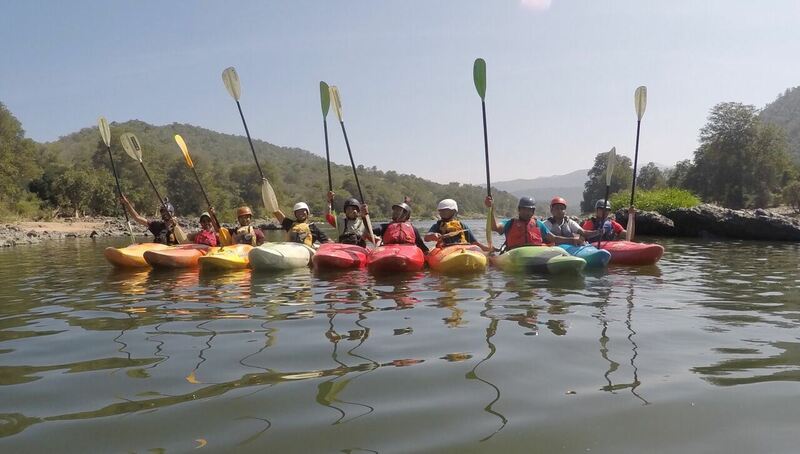 Thus was sown the seed for a group that sought to take Bengaluru’s kayaking beyond its lakes. “ There were five to six of us. Sohan had a proper whitewater kayak; the rest had duckies – inflatable kayaks,’’ Manik said. According to Sohan, over a period of time and after experimenting with a few names, the group came to be known as Southern River Runners (SRR). Paddling was largely seasonal; during the monsoon. In the rains, the rivers of the south swelled with water and for a few months as the water rushed from hills to the sea, select rivers became amenable for kayaking. Bengaluru’s kayakers traveled to Coorg and Chikmagalur in search of rapids. But there was a major problem. It was one that adventure sports earlier into India – like rock climbing – had faced. Pioneers have to navigate the rapids of social perception and judgement. When society is unfamiliar with any risky sport, it clamps down. Climbers saw this happen many times at various places in India before a degree of accommodation for their sport set in. 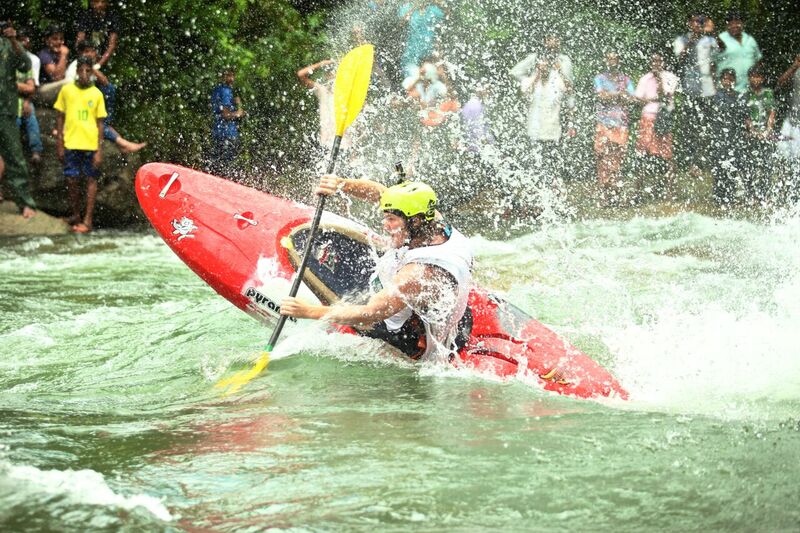 It was the same for whitewater kayaking in South India. Unable to comprehend what the kayakers were up to in the fast flowing, upstream section of rivers, forest officials and sometimes local people, objected, Manik said. And when such objection was overcome, permission became next challenge. In most instances such permission in India has to be obtained from officials unfamiliar with adventure sports and the human instinct driving it. Eventually as accessing water bodies became difficult, Bengaluru’s fledgling community of kayakers realized that the only way out was to grow their community further and enlarge the overall kayaking ecosystem. At the time of writing Jacopo Nordera ran a vineyard in Italy. Back in the time Bengaluru’s kayakers discovered that they needed to grow their community to get the sport going, Jacopo was part of the group of paddlers Manik belonged to. Jacopo lived in Chennai and every time there was a kayak session planned out of Bengaluru, traveled in from Chennai to join. “ He was the most committed member of the group,’’ Manik said. The two kayakers joined hands and formed a business composed of two distinct halves – a kayak school (called GoodWave Adventures) to teach the sport and a kayak shop (called Madras Fun Tools [MFT]), from where local kayakers can buy good quality equipment. A good kayak can cost over a lakh (100,000) of rupees. Manik said that prices at MFT are better than overseas despite import duty for kayaks beings high and General Sales Tax (GST) pegged to highest bracket. “ We have to grow the market and so keep our margins thin,’’ he said. 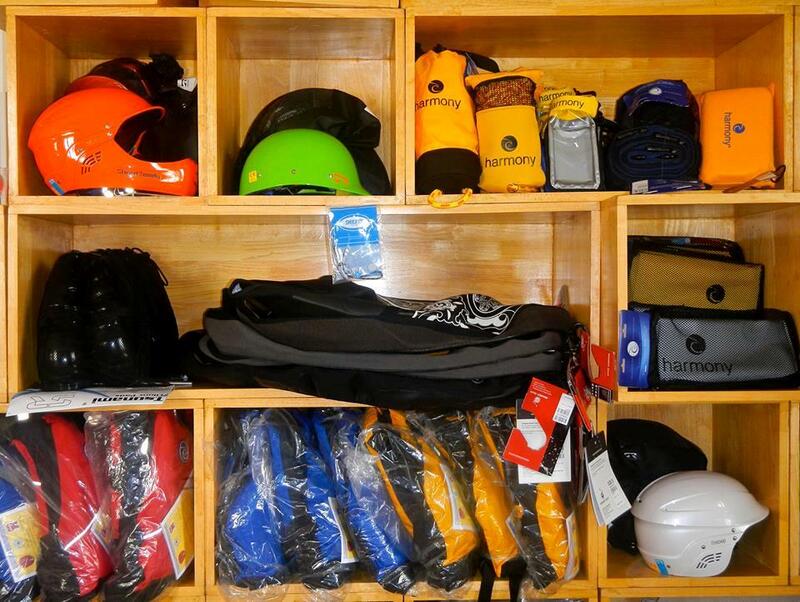 In tune with the overall niche market kayaking is in India, MFT is a small but profitable operation. “ It took us two years to sell the first container-load of boats. The second container, we sold all the boats in a year. Now we take 6-12 months to sell a container of boats,’’ Manik said. According to him, at least half of the total number of recreational kayakers in Bengaluru, own kayaks. Over time, the community around SRR grew. Those who had previously gone kayaking or formally learnt the sport joined the group. Resident expertise improved. “ Initially, everyone went to the same river. Now the group is mature enough to have different groups going to different rivers,’’ Manik said. In 2013, Manik and Jacopo did their instructor course in kayaking from Nantahala Outdoor Center (NOC) in the US. 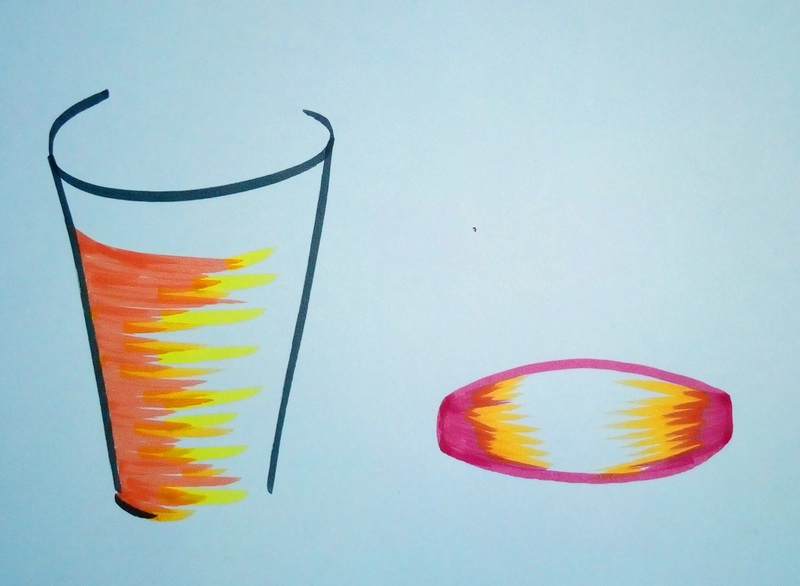 As SRR, GoodWave and MFT slowly grew, a new project started taking shape in the mind. Bengaluru’s kayakers had seen the Ganga Kayak Festival in Uttarakhand. How about one in South India; and if so, where? – That was the question. Besides equipment cost, one of the major components of overall cost in kayaking is transport. You have to take boat and paddler to river and within that, to specific section of river. Since rapids are a product of water volume, gradient, nature of terrain inside a river and surrounding geography (how it channelizes flow of water), the home of rapids are not always close to urban centers typically located in the plains. You have to travel to meet rapids. An element of research to make sure the destination one is heading to is apt to kayak, is appreciated before spending on transport and access. Google Earth was a great resource for kayakers to get a fix on rivers suitable for whitewater kayaking along with the best sections of river therein. “ Among us, Jacopo was the one who was most active on Google Earth, scouting for engaging sections of rivers,’’ Naveen said. For two to three years, SRR confined its activities to the rivers of Karnataka. Then it started to explore Kerala. “ We were skeptical. But Jacopo pushed for it,’’ Naveen said. On India’s map, Kerala is long and thin. 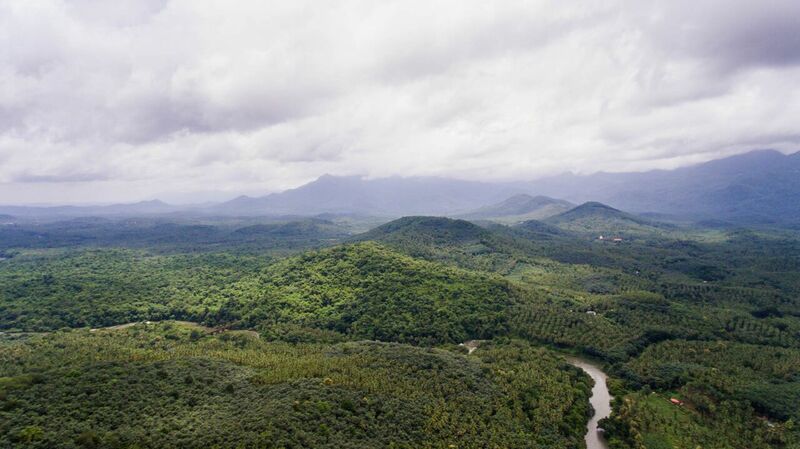 At its widest it is probably less than 150 kilometers but within such distance and less, offers landscape changing from seacoast to backwaters, rivers and hills. In terms of elevation this can range from sea level to 6000 feet plus (the highest point in Kerala’s hills is 8840 feet). It has 600 kilometers of seacoast and an equally long spine of high hills. The state is environmentally sensitive and if you take a bird’s eye view, short of space for the consumerist excess, which characterizes contemporary notion of success. Yet Kerala lived oblivious of its geography and environmental fragility. The floods of August 2018 changed popular imagination of life and Kerala, at least temporarily. A remittance economy measuring human existence by capacity to afford and lost to the deep end of settled life, the monsoons of that year combined with the deluge caused by multiple dams opening their shutters at once, flattened rich and poor alike. Suddenly people noticed geography and nature, both of which had been pushed to the backdrop for long and were now returned to center-stage. Across the state, the aftermath of flood was time to reflect and as many feared – reflect briefly – for Kerala’s deep rooted affection for wealth and consumerism is a bigger flood that can be kept at bay only for so long. By late September 2018, aside from their banks still adorned with the debris they bore when flooded, neither Chalippuzha nor Iruvanjippuzha betrayed any sign of monsoon’s fury. “ The water level has dropped,’’ the driver of our autorickshaw said looking down from the bridge over the rocky Chalippuzha. A rather tame river flowed below. 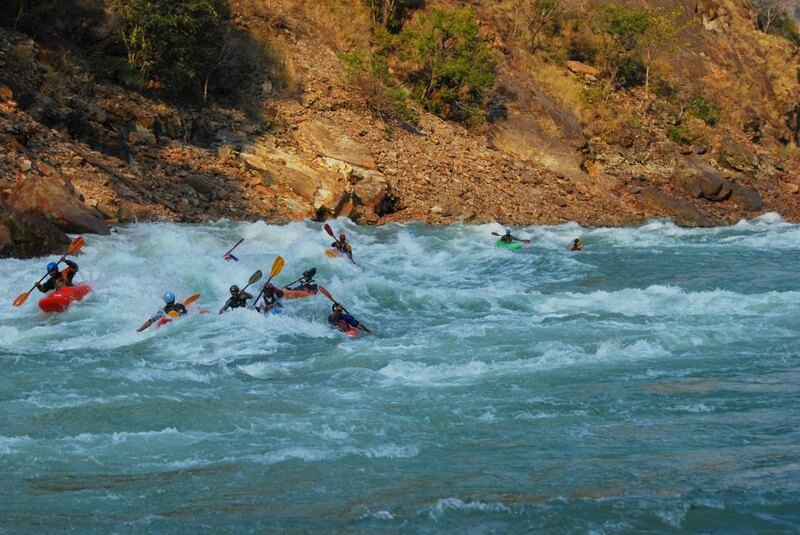 The only trace of white water kayaking around and an annual kayaking festival claimed to be among Asia’s best, was a house in Pulikayam rented by kayakers, where preparations were on to ship kayaks back to Uttarakhand, Bengaluru and wherever else they came from. This was GoodWave’s outpost in north Kerala, from where they ran a season of kayaking. The boats lay stacked in the courtyard of the house and inside the garage. Kayak season had ended in Pulikayam. It will return with the next rains; as would – hopefully – Sagar Gurung and Amit Thapa, river guides from the north. In the same room and chatting with Sagar and Amit, was Vishwas Radh from Balussery, a town roughly 30 kilometers away. Having kayaked regularly in the rivers near Pulikayam, he on the other hand, aspired for a taste of kayaking on the Ganga. 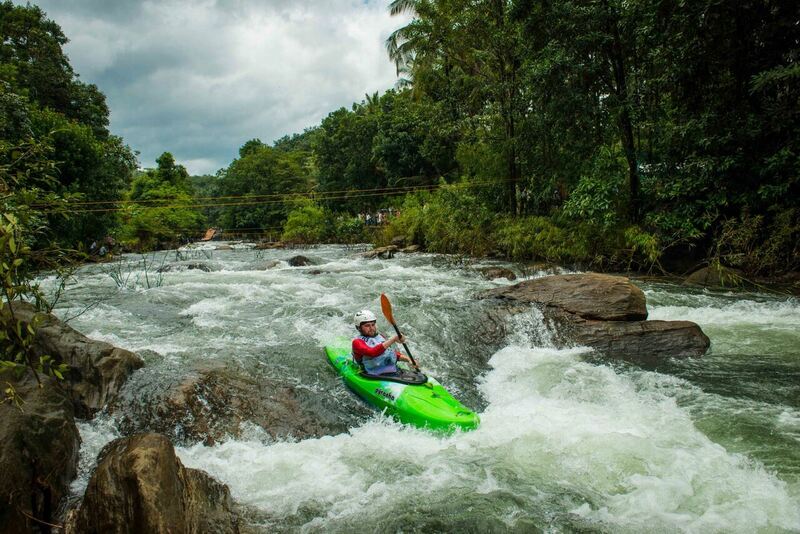 The gateway to whitewater kayaking in north Kerala is the small town of Kodenchery, some 40 kilometers away from Kozhikode. It is agricultural country; not in the paddy field sort-of-way but in the manner of plantations and densely vegetated, green land holdings typical of the hills. Three bank branches situated close by in town would normally hint wealth by remittance. But the drivers of the autorickshaws we hired as well as Joby who ran that home of delicious Kerala food called Janata Hotel, assured, wealth in these parts is mostly agrarian. Hailing from Wayanad, he had been in Kodenchery for the past 17 years, initially toiling as a farm worker, then driving an autorickshaw and eventually running the hotel. Janata Hotel was classic Kerala; affordable and serving portions big enough to satiate one’s hunger. It was practical, functional ambiance. Style and glamor had no place in it. “ The restaurant has just begun stabilizing,’’ Joby said of the business. Kodenchery is not far from the ascent to the hill district of Wayanad. The hills on the edge of Wayanad and Kozhikode were visible from town. The most prominent landmark around was a large hotel – Tushara International. You wondered how something that big ended up here. Yet securing a room over the weekend was difficult. They had none to spare (it is usually not so; a special occasion like a wedding can take up rooms, kayakers familiar with Kodenchery said). Not far from Kodenchery’s main junction, at Pulikayam, is Chalippuzha. Further away is Iruvanjippuzha. The former is a tributary of the latter, which in turn feeds into the bigger Chaliyar River. The Chaliyar, close to where it met the Arabian Sea near Kozhikode, was host to Jellyfish Watersports, an enjoyable destination for paddlers into gentler, expansive waters. 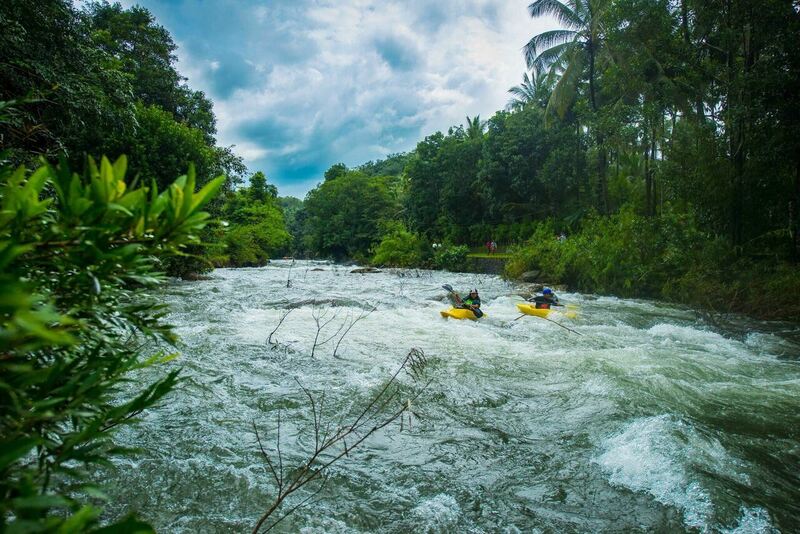 The first people to do whitewater kayaking near Kodenchery were Jacopo, Manik, Naveen and a few others from Bengaluru. Some aspects about the two Kerala rivers and Kodenchery attracted them. Between the two rivers and the sections on them selected for kayaking, they found a healthy balance of technical kayaking and voluminous water flow. The rivers of the Western Ghats maybe small compared to those of the north. But they have good gradient and as in the case of Chalippuzha, is rocky, requiring a degree of technical expertise to negotiate its stretches. With rapids ranging from Class 3 and below to Class 5, both amateur runs and pro runs could be hosted. Above all, after encountering suspicion and hostility in some of their previous river exploration trips, the group from Bengaluru was happy to see none of that attitude in Kodenchery. Naveen recalled the kayakers’ first visit to Kodenchery and the nearby rivers. “ Jacopo had done all the required scouting on Google Earth. The section of river we kayaked on wasn’t inside the forest. It ran through villages and as the kayaks navigated their way downstream, word quickly spread of what was going on. By the time we reached the bridge at Pulikayam there was a crowd of enthusiastic people gathered to witness the proceedings. We stayed at Tushara International. On the last day of our trip, a local journalist appeared and said someone wished to talk to us on the phone. It was the District Collector! He welcomed us to the state and offered support. That was a big difference compared to what we had encountered previously, elsewhere,’’ Naveen said. Nistul, who hailed from Kodenchery, attributed the local support for kayaking to Kodenchery’s innate affection for sports. According to him, the region has produced district level swimmers and a clutch of physical education teachers. “ We were swimming in these rivers before kayaking reached Kodenchery. When we saw whitewater kayaking, more than anything else we became curious to learn it,’’ he said. Further, within Kerala, north Kerala has always been close to sports. The famous track athlete, P.T. Usha, hails from this part of the state (she is from the adjacent Kannur district). India’s first cricket club was founded in Thalassery and while cricket never really fascinated Malayalis, football has stayed much loved madness. There are many national level football players from north Kerala and during the FIFA World Cup, international football stars are portrayed on posters, wall paintings and the sides of transport buses. This is sport loving-country. Once they got a feel of the rivers, mapped out its stretches suited for kayaking and sensed the local community’s empathy for sport, Manik and others from Bengaluru knew they had found the venue for the kayak festival they sought. In otherwise quiet Kodenchery, the annual Malabar River Festival (MRF) seemed appreciated as a valuable revenue generator for the local economy. It brought international caliber kayakers, lovers of the sport and tourists to town. Several people we spoke to found it an engaging fixture. Tushara International serves as base camp for the festival. The house at Pulikayam rented by kayakers was known locally as Kayak House. Say so and autorickshaw drivers knew where to drop you off. MRF, which is now supported by local authorities and the state government, has carved a niche for itself. The event is well known in the global kayaking community; the sections of river it is based on are deemed world class for whitewater kayaking. Diligent and smart marketing aside, the event has merits founded within the sport. “ In India, this is probably one of the hardest courses. In the north, volume of water and its temperature make a difference. But in the Western Ghats, rivers are typically steep making for narrow passages and tighter maneuvers. Less water volume in these rivers also means that they are less forgiving; chances of physical injury are high,’’ Manik said. The event attracts some of the world’s best kayakers. Of greater interest is how over multiple editions of the festival, kayaking has sprouted roots in Kodenchery. 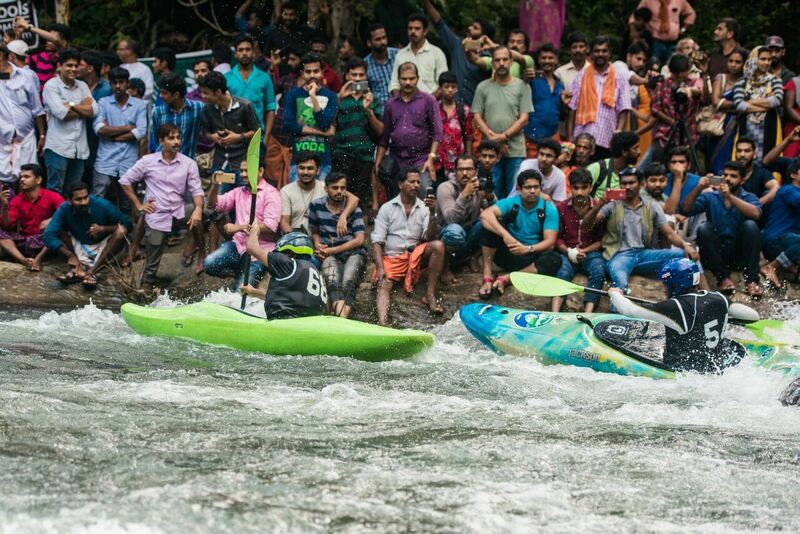 There is now a small team of kayakers from the region, regularly paddling in the two rivers, competing in MRF (with podium positions earned in amateur category) and hoping to earn a name in India’s kayaking scene. Nistul and Kevin were among them. Other names included Nitin, Vishwas and Reshmi. About 18 people from the locality had initially trained in the sport, Kevin said. Ten of them continue to be active. Those this blog spoke to recognized Jacopo and Manik as their main teachers (Manik’s approach of holding down a regular job even as he pursued his passion of kayaking and managing a business, seemed preferred pattern for the trainees too; of the three we spoke to, at least two weren’t targeting full time kayaking). Training sessions with expert kayakers arriving to participate in MRF were bonus. Visiting kayakers and the group from Bengaluru have provided a few kayaks to these enthusiasts. But they had two constraints. First, the transport component in kayaking – the need to carry self and kayak to where the chosen section of river can be accessed – makes every outing expensive. You need a vehicle. You need money. There was talk of sponsors. But if they are not adequately self-aware and self-critical, sponsorship can be delusional sense of accomplishment for young athletes. Real sport is a long journey and the right ecosystem is one that keeps it so. How do you support athlete and yet keep the journey long and continuing? Second, given kayaking is seasonal experience in Kodenchery and the water level in the two rivers drops once rains recede, year-round training is not possible. When water level falls, paddling and practising of skills reduce to what is possible within the stretch afforded by a check dam at Pulikayam. Those committed to the sport, wished to spend time in the rivers of North India. Moving to northern rivers like the Ganga, when water levels fall in Chalippuzha and Iruvanjippuzha, appeared the right thing to do. It made sense from another angle too – a paddler’s repertoire of experience is based on the variety of waters he has tackled. You can’t be well rounded in the sport if all you know for experience are two rivers. Kodenchery’s kayakers have a long way to go. Looking ahead, Manik hoped that more considerate import duty and tax structure would grace kayaking. He also wanted the sport to find greater acceptance and merit more towns hospitable to kayaking like Kodenchery. As yet even within Kerala, Kodenchery has proved an exception for some later river exploration trips in the state didn’t find the same popular support as extended at this settlement near the border of Kozhikode and Wayanad. But a model to spread kayaking, commenced from Bengaluru, has worked – training school, gear shop and community of those practicing the sport. The results encourage. An incident in Spain unsettles the young Indian cyclist. Recovered from it and resolved to complete what she began, she is back on her project, circumnavigating the world on a bicycle. 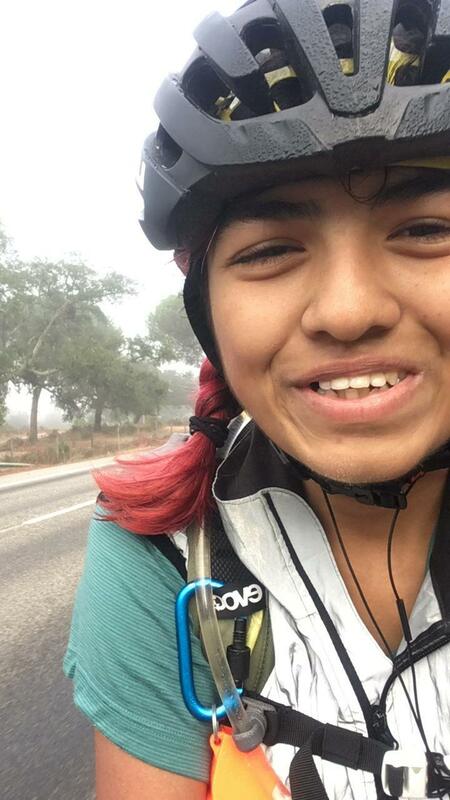 Nineteen year-old Vedangi Kulkarni, currently on a quest to circumnavigate the planet on a bicycle, suffered an incident of mugging in Spain early October. Recovering from the setback, she has since reached France and at the time of writing this report, was cycling there. Her father Vivek Kulkarni, shared Vedangi’s description of what happened, with this blog. 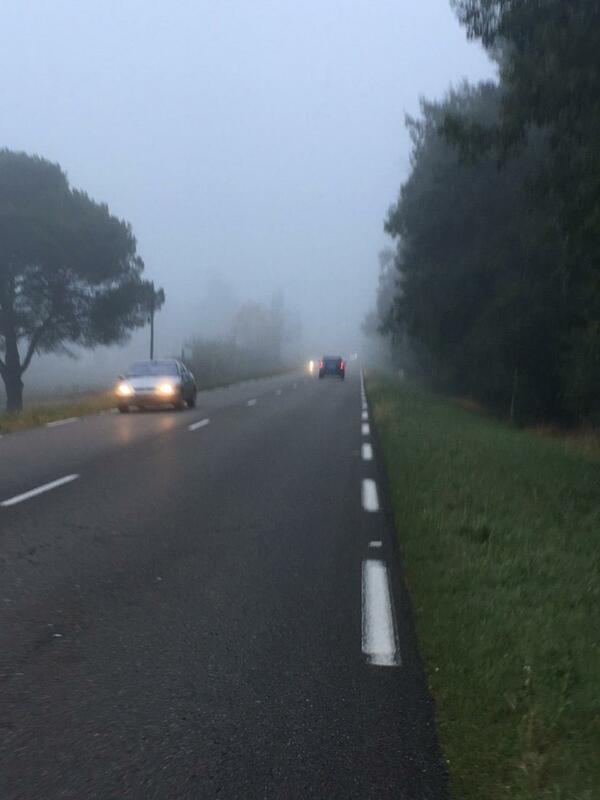 According to it, on October 6, around 21.30-22.00 hours, somewhere around Guarena in Spain she was stopped by a couple of people on motorcycles. They had knives and while one of them took her hydration pack and started examining its contents, the other held her at knife-point. They took the money she had in her bag. Then they pushed her and her bike into “ what seemed like a ditch at the side of the road.’’ Vedangi went down head first and suffered a concussion. She informed the police of the matter, including her recollection of how one of the assailants looked like. A few kind strangers, upon realizing what happened, later took her to a medical center; that’s how the concussion was discovered. Vedangi has had to take it easy for a few days thereafter. But she has persisted with her solo circumnavigation project. “ Frankly, the incident had terrified me and I was inches away from giving up on the entire ride. But something in me didn’t just want to let go of everything I’ve built up so far and somewhere inside me I know that giving up and going home without finishing what I’ve started is never an option,’’ she wrote in the account, shared with India’s Ministry of External Affairs as well. Officials are aware of it. At the time of scripting the description of the incident (she was in Spain then), Vedangi was more than 17,500 kilometers into her circumnavigation trip and had already cycled across Australia, New Zealand, Canada and Portugal. In the process, she crossed both the antipodal points advised under circumnavigation rules – the first was Auckland in New Zealand and the second, Madrid in Spain. Cycling in Spain was to be followed by passage through France, Belgium, Germany, Denmark, Sweden, Finland, Russia and Mongolia. “ I had reached the halfway point at 14,432 kilometers in 55 days,’’ she wrote, adding that her experience with people worldwide had been mostly “ extraordinary.’’ Before reaching Spain she also had a brief spell, cycling in Iceland. That didn’t go well. There were storms; there appears to have been a minor mishap on the road as well. “ Given the incident (in Spain) and the concussion she suffered, she had to take it easy for some days. In that period her daily mileage fell. It is only now that she has managed to ramp it up again,’’ Vivek said. The record Vedangi originally wished to improve upon is the one held by Italy’s Paola Gianotti. In 2014 she cycled the distance – although not in consecutive stages – in 144 days. Like Race Across America (RAAM), Trans Am too is a bicycle race across the United States. There are however some crucial differences. Trans Am is an unsupported race; cyclist has no support crew. Trans Am features no cut off time within which to finish. Those who wish to see it as a race, treat it so. Records are set and bettered. There are also those who cycle at their pace, leveraging the race and its course through small town USA to experience the country in a manner that is different from mainstream. Nishanth Iyengar from Bengaluru belonged to this second category. 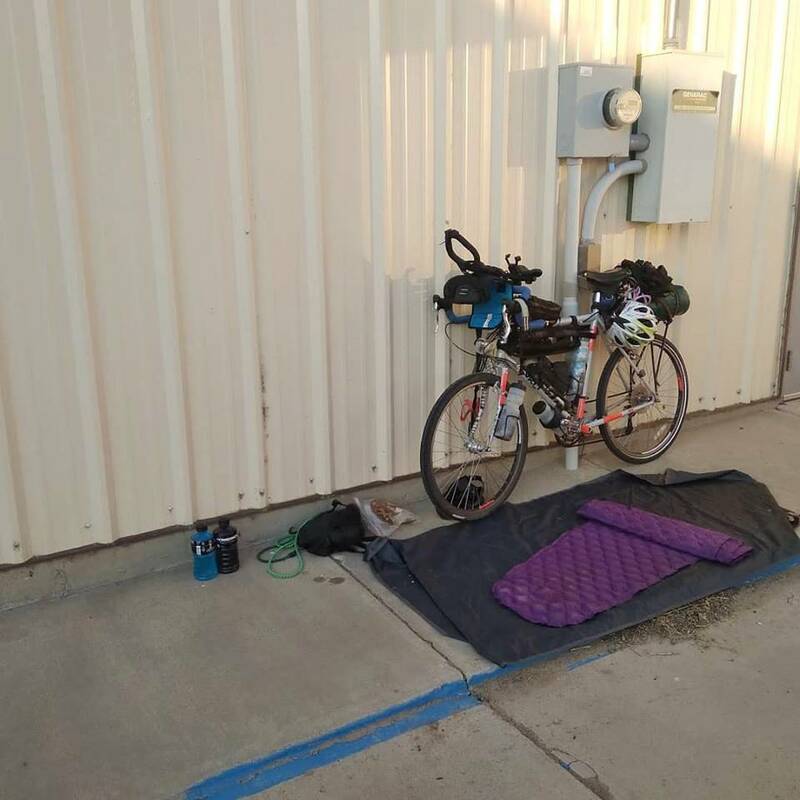 This article is about his journey to being a touring cyclist and eventual participation in 2018 Trans Am. “ I like seeing new places. I don’t like anything structured. It is very hard for me to work in a structured environment,’’ Nishanth Iyengar said. Between cyclist and freelance journalist, we seemed to have struck a healthy compromise. Writing’s eccentricities often gravitate towards the old and familiar; some place known that you can settle into and listen to a story or type out one. We were at Koshy’s in Bengaluru, as landmark as a restaurant can get anywhere. It was regular haunt for Nishanth and adequately lived in for old school scribe to feel comfortable. The conversation was however cyclist’s way – we sat inside the restaurant and whenever a smoke beckoned Nishanth, we shifted to the side of St Mark’s Road, sat on the building’s skirting and continued the conversation. I understood well when Nishanth said structured approach puts him off. Born 1985, Nishanth grew up in Bengaluru, the only child of his parents. Following school education, he studied instrumentation technology and then proceeded to run a business for four years while pursuing a MBA alongside. For project work as part of studies, he worked on developing a marketing model for a circus that was then camped at Kanjirappally in Kerala. However in 2012, he ended up an hour short of required attendance at college and wasn’t allowed to sit for his exams. In regular Indian life with emphasis on exams and marks that would qualify to be a crisis. Nishanth on the other hand elected to remember a longstanding dream – he had always wanted to visit Nepal. Why not cycle in Nepal? – He wondered. Yet again, for most people that would be a project. Nishanth wasn’t a driven cyclist; he wasn’t the sort training diligently with objectives in mind. “ I can’t wake up early and ride 100 kilometers in a disciplined way,’’ he said. Similarly even though he liked to travel on his motorcycle, he rode with a group of motorcyclists just once. Traveling in a group wasn’t his scene. For Nishanth, motorcycle touring was an earlier fix than cycling; he had commenced riding long on his motorcycle in 2003. The bike was a 150cc Pulsar; he used bungee cords to keep his travel kit in place and did little homework before any trip. He based his approach on two beliefs. “ If somebody has done something, I know I too can do it. Second, I really, really like the unknown,’’ Nishanth said. On his motorcycle, Nishanth rode from Delhi to Leh; he also visited Rishikesh. It was on that trip that he used a tent for the first time. Now he was courting a different dimension of adventure. Two wheels still, but no engine; strain, slow moving and sensing universe. When the idea of cycling in Nepal assumed shape, he bought a MTB – a Bergamont VTOX 6.2. He took it with him to Kathmandu and cycled a few thousand kilometers in that country, eventually exiting Nepal and entering India at Gorakhpur. Significantly on this trip, except for accommodation in Kathmandu and Pokhra, he didn’t stay in a hotel anywhere. After his return from this trip, he completed his MBA. Then with some money made from the business he ran later, he decided to attempt something afresh in cycling. This time he thought of riding from Bengaluru to Leh and thereon to Uttarakhand. While the route of this trip had to be tweaked owing to floods in Uttarakhand, Nishanth learnt a few things about cycling. He realized that it is wise to avoid pedaling during the hot hours of afternoon spanning 1 PM to 4 PM. When he kept getting punctures continuously he found that he could manage with Indian tubes for replacement; solutions of this sort altered the imagery of high cost attached to touring. He also learnt to approach time and competition differently. “ The worst thing that can happen is that I lose time. That is okay with me. I tell myself that it’s okay not to reach the end. It takes away a lot of the pressure. As for competition, I really don’t care,’’ he said. Redefining perception of time and one’s sense of self within the compulsions of the human collective are crucial to appreciate journey. What these steps seem to have done for Nishanth is – make riding more enjoyable. “ I am happiest when I ride my bike,’’ Nishanth said. He began going on a cycle trip of 3-4 weeks every year. In 2015, he rode extensively in Tamil Nadu. According to Wikipedia, the oldest known use of helmets is from 900 BC, by Assyrian soldiers. They used it as protective head gear during combat. Combat and competition are cousins separated by degrees of interpretation. Over the centuries, the helmet has evolved from protection used while fighting to protection advised for a range of sports and thereon, as daily life grew competitive and distracted with capacity for accident – as protection used during daily commute by two-wheeler. Notwithstanding laws, in India, the helmet has frequently divided riders into polarized camps. There are those who embrace it and those, who are averse to it. Nishanth belongs to the latter category. “ I dislike helmets. I was looking for a long distance ride that did not have a rule requiring compulsory use of helmet,’’ he said explaining his choice of Trans Am, the annual bike race across United States. Nishanth said, Trans Am advises use of helmet but does not make it mandatory. 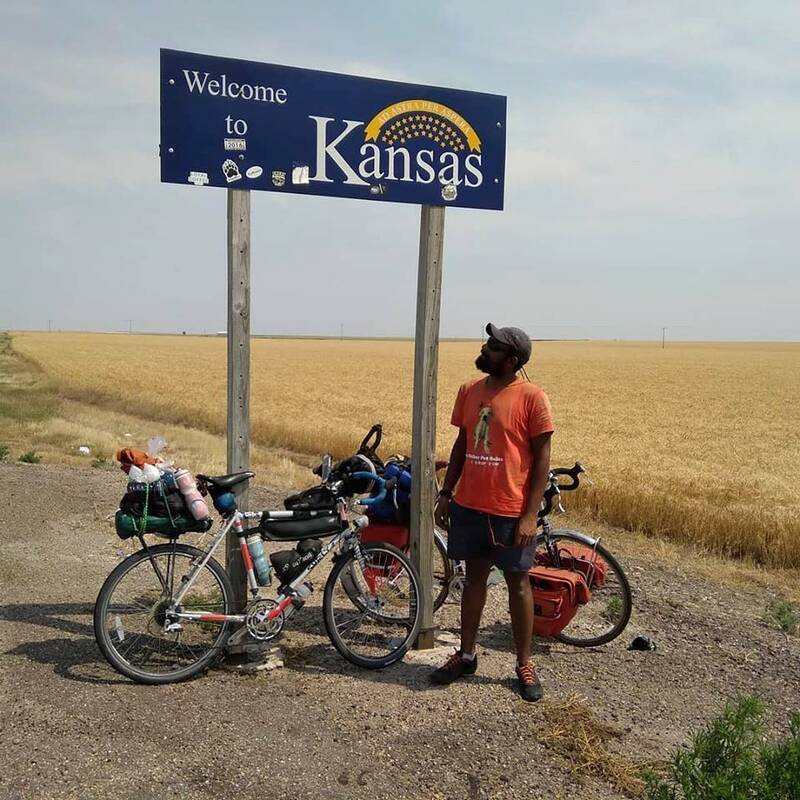 He had always wanted to cycle long distance in the US; this race appeared perfect. Trans Am is an interesting event. It is similar to Race Across America (RAAM) in that it involves riding across the US. But unlike RAAM, wherein cyclist pedals with crew for support, Trans Am is unsupported or self-supported; there is no crew, cyclist is on his / her own. Further, unlike RAAM which is distinctly identified as a race, Trans Am is a race and not one depending on how one treats it. Records are set by those who treat it as a race. 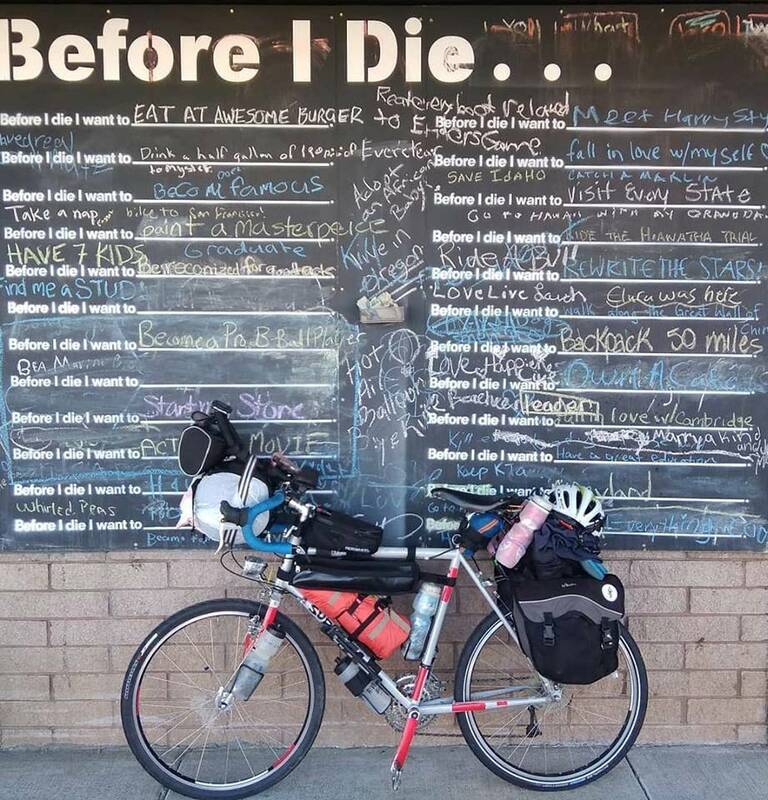 At the same time, there is no cut-off time, leaving others wishing to cycle across the US and experience the country at ground level, free to do so at their pace. This experiencing of the country is what Nishanth does on his bicycle tours. Typical of him, Nishanth kept his homework on Trans Am limited so as not to crowd out the pleasure of discovering with information overload on race and US. That would prove both good and bad. Among things he didn’t realize was that Trans Am is not a straight line across the US; it goes up and down collecting more miles than RAAM. Attempt Trans Am in 2017: that was his initial thought. Meanwhile on the work front, he had shut down the business he commenced. Following that, he joined Runners For Life (RFL), helping out in the sales department. During this tenure, he did a bunch of half marathons, a full marathon and also a 50km-run. After a year and a half at RFL, he joined Practo, a start-up that helps consumers locate doctors and healthcare information (at the time of writing Nishanth had moved from Practo to Proline India, a longstanding company in the sportswear and casual clothing space). Having toured within India on a bicycle and realized his affection for it, Nishanth had been on the lookout for a good touring bicycle. The model he had in mind was the Surly Long Haul Trucker. The choice was inspired in part by a couple of cyclists he met in Leh, who praised the model, particularly the combination of the bike with a Brooks saddle. Surly – it specializes in steel bicycles and frames – commands much respect in the community of cyclists into touring. The Minnesota based-company’s Long Haul Trucker model is often praised for its reliability and value for money spent. In 2015, roughly a year after Nishanth’s return from his last bicycle trip to Ladakh, he met a person in Bengaluru who wished to sell a Surly Long Haul Trucker. It was the old model with 26 inch wheels. The bike had a market price then of Rs 125,000. Nishanth got it for Rs 75,000 plus all associated gear the seller had acquired. “ Every opportunity I got to ride my bicycle, I availed it. I loved it,’’ Nishanth said. By now another transition was afoot. Although he began touring on a motorcycle, the bicycle and its simplicity won him over. “ I lost my mojo for motorcycle touring,’’ he said. In 2016, he cycled for a month in North East India. The following year, 2017, he got married and spent his honeymoon in Russia, including a journey on the Trans-Siberian Railway. That along with the couple’s shared affection for dogs – they adopted some as pets; it entails commitment – meant that Trans Am in 2017 was a non-starter. On the bright side, Nishanth’s wife understood his interest in Trans Am. In 2018 she said: go for it. She joined his friends in gifting critical pieces of gear and equipment to Nishanth. The need for a smoke beckoned. Outside Koshy’s, a gentle rain was on. Nishanth lit a cigarette. We sat perched on the building’s skirting; Bengaluru’s traffic in front, lively restaurant behind. Existence is one and a series of partitions at once. To journey is to shift between partitions, make them translucent and be aware of universe. “ For registration, visa, tickets – all put together, I must have spent between 3000-3200 dollars. Additionally I would have spent around 2000 dollars for gear, food and accommodation,’’ Nishanth said of his journey to 2018 Trans Am. It was his first visit to the US. But he plunged into the task at hand. From Seattle, he cycled to Astoria, the starting point of Trans Am. For company he had a cyclist from Poland, also heading for Trans Am. In Astoria, Nishanth met Don Harter. His attempt of the 2018 Trans Am was Don’s retirement gift to himself. Nishanth and Don bonded; they decided to ride together. Given Trans Am provides participants with a digital map, “ riding together’’ does not mean being together all the time. 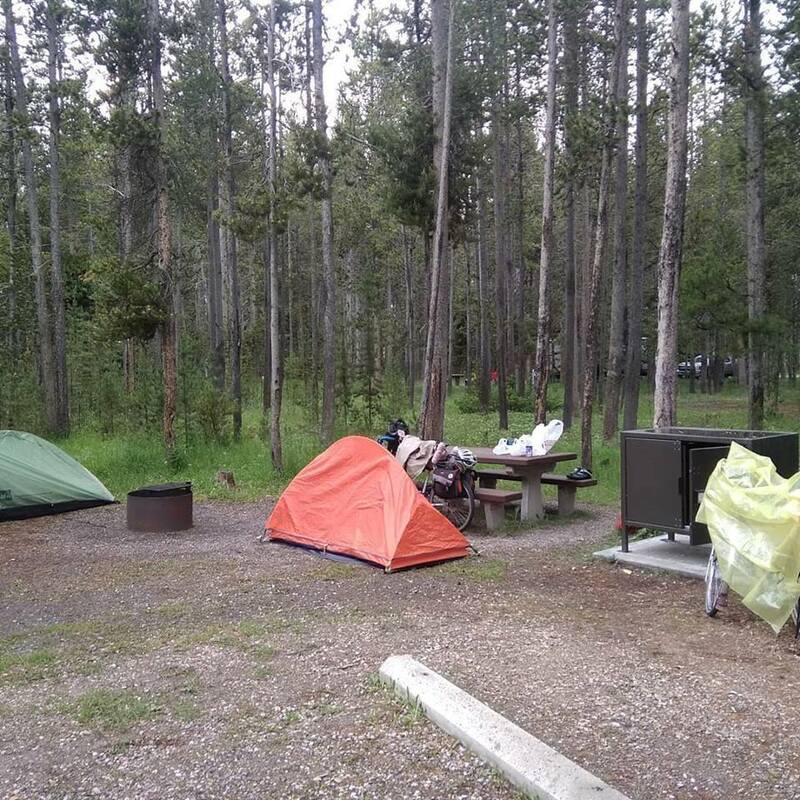 You may be cycling considerably apart; you keep a lookout for each other and sometimes plan rendezvous points to decide on places to stay or camp. For efficiency, Nishanth also divided the race into two broad stages. Soon after he completed the ride through the colder sections of the race, he packed all his cold weather gear and couriered it to an address at the finish line. True the Appalachian mountain was still ahead but Nishanth reckoned it won’t be as cold as what he had already endured. The decision to send away what he did not need made his bicycle lighter. Trans Am proceeds from Astoria in Oregon to Yorktown in Virginia. 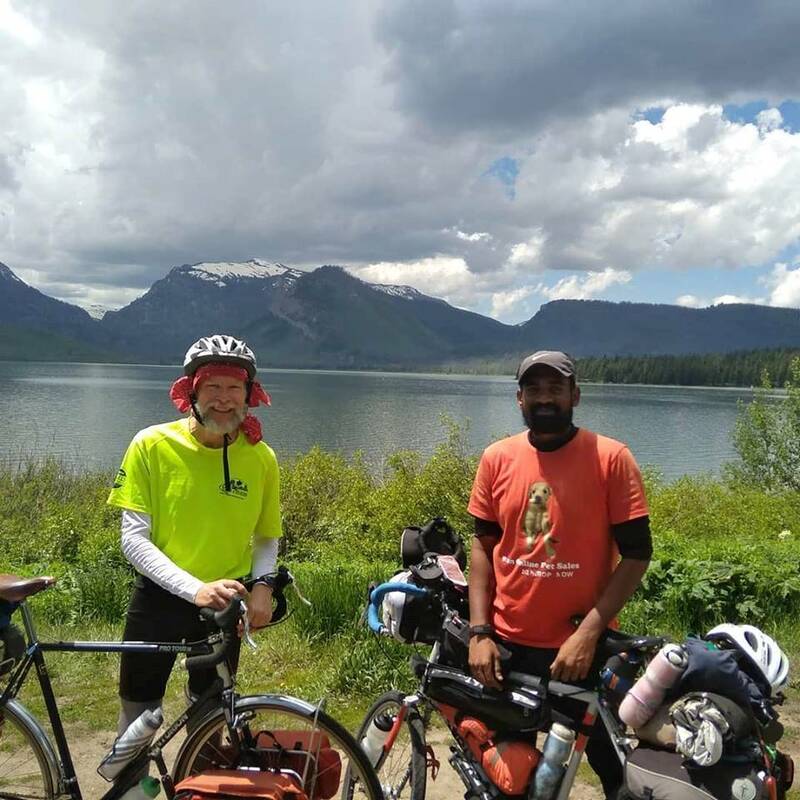 Nishanth began cycling from Astoria on June 2, 2018. He reached the finish line in Yorktown on July 28. Towards the end, Nishanth admitted he felt some pressure. It had nothing to do with Trans Am. Although the race had no official cut-off time to meet, return tickets to India already booked meant a deadline by which Nishanth should wrap up his outing at Trans Am. Developed and mapped by Adventure Cycling Association, the TransAmerica Bicycle Trail was the first bicycle touring route across the US. It was the route for Bikecentennial, a massive cycle tour organized in 1976. Bikecentennial was part of celebrations to pay tribute to the historical events leading to the creation of the US as an independent republic. Trans Am uses the TransAmerica Bicycle Trail. The route, which includes plenty of minor roads and bike paths, gives insight into small town America. Like most big races, Trans Am has its share of those who do not finish. 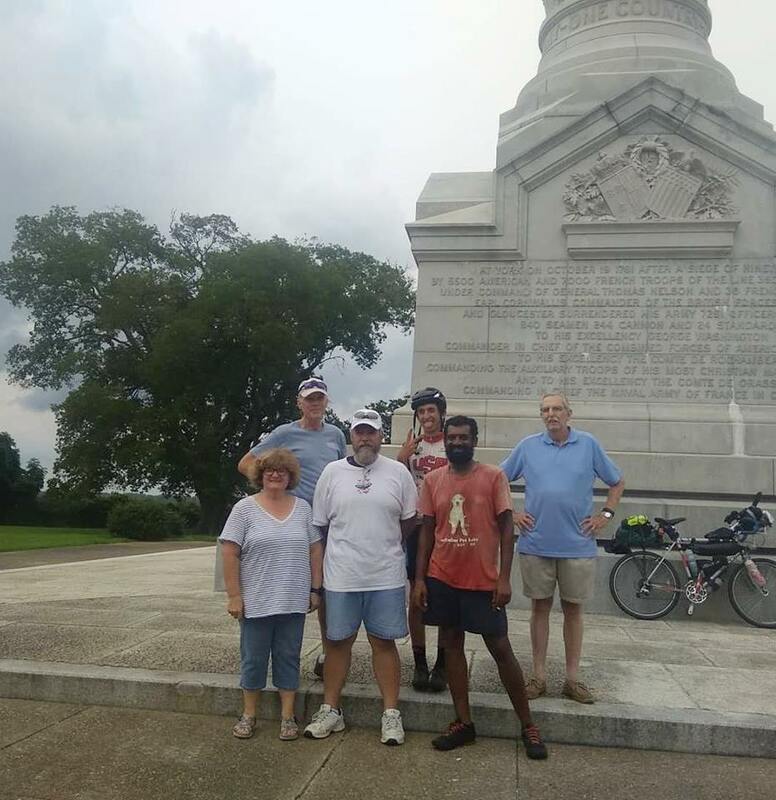 From among those who completed the race in 2018, Nishanth was one of the last to reach Yorktown. That was eminently acceptable for the bicycle tourer from Bengaluru; speed was never part of his plan. Seeing the country – the real US – was the priority. 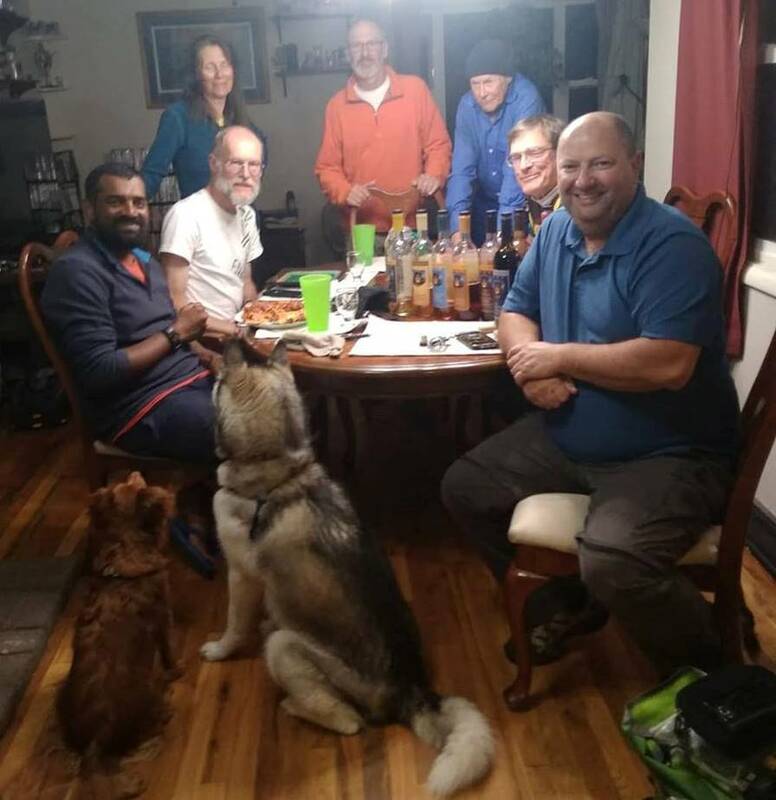 I asked Nishanth how he managed to feel secure and comfortable in utterly new country, that too off the beaten track, for most Indians – both as tourists and resident in the US and chasing livelihood – typically cluster in American cities. “ Nobody did anything harmful to me. If you shut up and mind your own business, nobody troubles you. I talked to people as people,’’ Nishanth said. There is also another angle. Nishanth is usually lone tourer on bicycle; he has no group, no support crew and thereby no ecosystem of the familiar around to breed the ingredients for manufacturing prejudiced views and mental baggage. He takes each day as it comes. “ I live in utter poverty when I ride. Every day I have to look after myself. The need to look after myself gets me talking and engaging with world, makes me an explorer. Further, when you are poor, the universe opens up,’’ Nishanth said. Among the highlights of his trip was experiencing July 4 in small town USA. According to him, aside from the money he spent on race registration, airline tickets, visa, food, gear and accommodation away from race – figures mentioned earlier – his actual expense on accommodation during the race (June 2 – July 28) was 50 dollars and 50 cents. As for the Surly, it proved trustworthy steed. There were no breakdowns; not even a puncture during the 6800 kilometers covered. Bengaluru had by now drifted into after office hours. Koshy’s was gathering more people and conversation. A motorcyclist dropped by at the table to congratulate Nishanth on Trans Am completed. We briefly discussed his proposed tour overseas on a motorcycle. It was a major undertaking and there were aspects he needed assistance going over. The feel of a conversation about motorcycle touring is very different from one about bicycle touring. In the former, steed and rider are not exactly one. Courtesy its engine, a motorcycle has capabilities of its own. Bicycle on the other hand is a lot like one of those prancing horses dancers get into at festivals. Steed is rider’s half; there is only you to commend, you to blame for performance. As the motorcyclist left, the conversation reverted to life on human powered wheels. Both of us were three cups of coffee-old. The vast majority of bikes used at Trans Am were road bikes, Nishanth said. They carry less but move fast. Looking ahead, he said he would like to invest in a new bicycle. A road bike makes no sense for he knows he is not the racing type. A cyclocross model perhaps? – That’s a thought. Nishanth’s future projects included a north-south ride in Europe, a ride around Australia and maybe a foray into riding with groups; the latter an attempt to see if it encourages the wife to take up cycling. This blog lost a good friend, the evening of October 16, 2018. Thakur Singh, longstanding employee of NOLS India, passed away in a road accident in Ranikhet. At the school, Thakur oversaw the maintenance of outdoor gear. Through the years, many batches of NOLS students and instructors have met him. He made sure that the gear and equipment, which every student expedition heading out to the field took with them, was in good condition. When they returned from the field, he made sure that all that was loaned from the gear room was accounted for, cleaned and maintained for use by expeditions to follow. More important, as one of the senior hands around, he worked across functions in the early years of the school and saw it grow. His quiet nature concealed the experience he had gathered in his line of work. He was an asset to the school and a big help to outdoor enthusiasts – NOLS alumni and otherwise – who dropped by. You had a tent, jacket, sleeping bag, backpack, trekking poles, stove, boots, rope; any gear that required care and attention – you turned to Thakur for advice. Mainly due to his commitments at home, Thakur rarely ventured into the outdoors, as in on a hike or trek. He typically kept a daily schedule that shuttled between work and home. Several years ago, I had the good fortune of hiking to Khati (in the Pindari valley) with him, camping there and returning the next day after attending a colleague’s wedding. He was a happy soul on that trip although he kept worrying whether we would get back to Ranikhet in time. It was only his second visit to the Pindari valley. Thakur mostly stuck to the NOLS India base in Ranikhet, attending to his work and being Man Friday to anyone requiring assistance. He was quintessential person in the background; someone whose value you wake up to, only when he is gone. As I write this, I realize, I don’t have his photo. Thakur will be deeply missed. He leaves behind parents, wife and three children. He was sole bread-winner of his family. 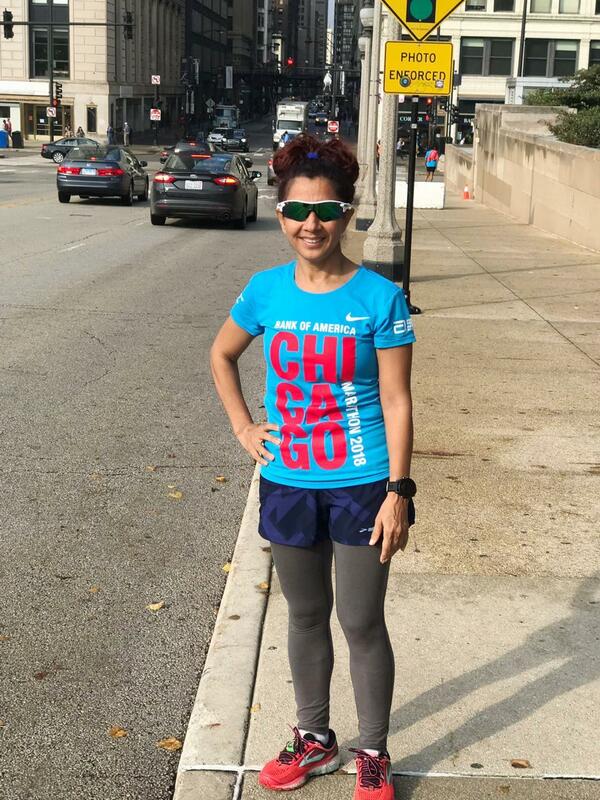 The 2018 Chicago Marathon happened on October 7. Part of the World Marathon Majors, it is the fourth largest race by number of finishers worldwide. This year’s edition was won by Mo Farah of Great Britain. He finished the full marathon in 2:05:11, a new European record. It was Farah’s first victory in the discipline. Among women, the winner was Brigid Kosgei of Kenya who covered the distance in 2:18:35. 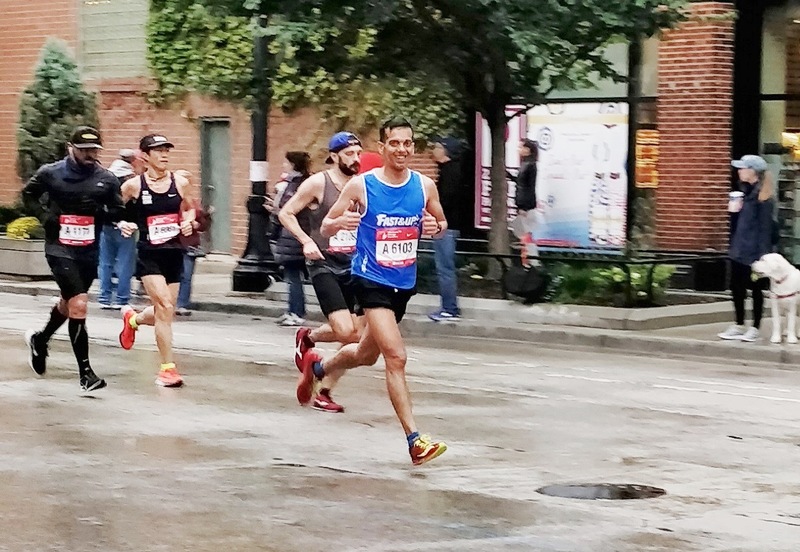 The Chicago Marathon is known for its cheering with spectators lining the street and encouraging runners on. Despite windy conditions and rain, this year too, the cheering stayed strong. 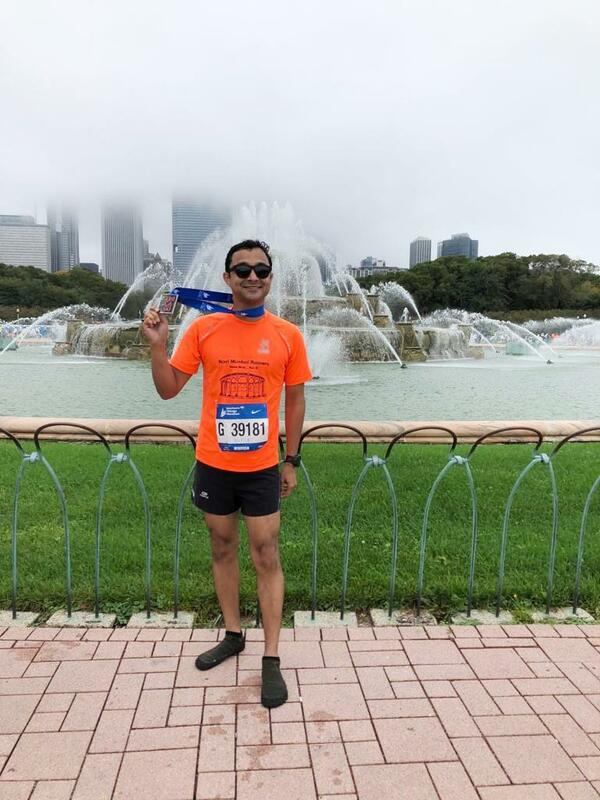 We spoke to some of the amateur runners from India who participated in the 2018 Chicago Marathon. For the last three years I have been attempting full marathons at international destinations, including the World Majors. Chicago Marathon has the option of direct entry on the strength of timing. I had applied and secured entry to this event known for its flat route. World records were set here until Berlin Marathon came into the picture. Chicago Marathon’s route entails more turns compared to that of Berlin. The weather is also an issue. Chicago is known to be a windy city and is prone to temperature fluctuations. My run went off very well and I ended up with a sub-three timing of 2:57:11 hours. This is my second fastest timing. My fastest so far is 2:55 hours set in Berlin in 2016. At Chicago, it was quite chilly with temperature around 10-12 degrees Celsius. It was windy and there was rain. For those of us coming in from warmer countries like India, Chicago’s weather can be challenging. Thankfully, I had appropriate clothing including head gear and gloves. I made sure that I did not get wet till the start of the race. Chicago Marathon has awesome cheering with some 1.7 to 2 million people lining the streets all through the 42 kilometer-route. It is truly a city marathon as the course passes through the heart of the city. I landed in Chicago on Monday, first day of race week, to avoid the lingering tiredness of travel and jet-lag. Broadly speaking, my goal in timing was to run a comfortable sub-three hour marathon. The cold conditions during the race were okay but rain was a dampener. If it hadn’t rained I could have chopped off a couple of minutes from my timing. I ran quite well for 35 kilometers but slowed down during the last seven kilometers. I would like to focus on the full marathon for the next couple of years. It is important therein to keep fit and stay injury-free so that I can continue running sub-three marathons. I hope to do New York City Marathon in 2019. In the meanwhile, I will also do shorter distances such as 25 kilometers, half marathons and 10 kilometers. Running shorter distances at a faster pace helps in running marathons. 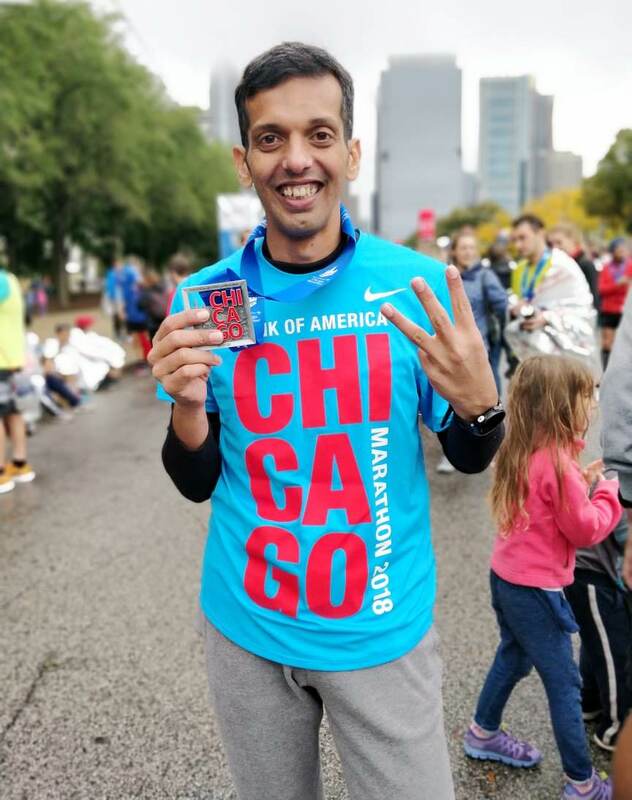 So far, I have done five marathons in a timing of under three hours – Boston Marathon, Paris Marathon, Berlin Marathon, Mumbai Marathon and now Chicago Marathon. Each marathon poses a new challenge. Also, training for marathons takes up three to five months. Staying injury free is key. I have been running for the past seven years. 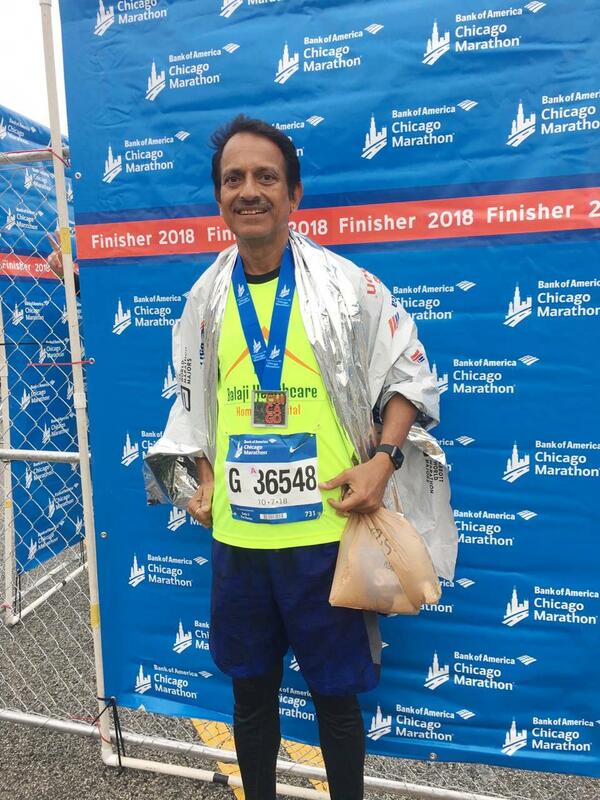 Chicago Marathon was one of my best runs. For me, the race went as per plan. I had trained for the preceding nine months. I recorded my personal best of 4:25 hours with more or less equal splits – the first half in 2:11 hours and the second in 2:14. It was one of those runs where I felt strong throughout the race and did not hit a wall after 30 kilometers. I was a bit apprehensive a day before the race when it was predicted that it may rain at the start. But the weather was cool throughout and though it did rain heavily midway during the race, the body was sufficiently warmed up and in rhythm. 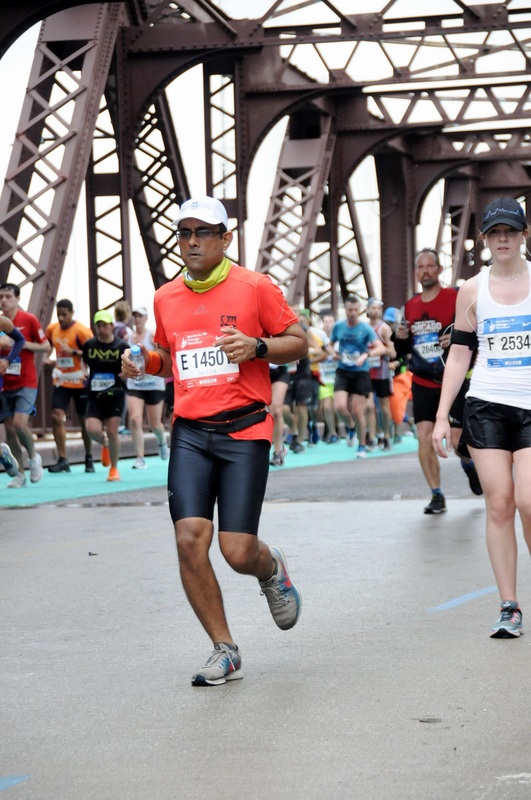 This run at Chicago Marathon was part of a plan to complete all the World Majors. I have now completed three out of six; New York in 2016, Berlin in 2017 and Chicago in 2018. I will be doing the London Marathon in April 2019. I do not have any plans to do Chicago again in the near future. Chicago is the second largest marathon in the US with approximately 40,000 runners. New York has around 55,000. It is mostly a flat course. More than a million spectators line the streets throughout the course to cheer the runners. The atmosphere is electrifying. I would highly recommend the Berlin and Chicago marathons to runners seeking a go at their personal best. Although I have been running for the past seven years, I never trained seriously for any of my races. I started running in 2011 with my office colleague Sandeep Parab. We quickly graduated from running half marathons to full marathons and were always on the lookout to run races wherever our office work took us. Visit and explore a new country and run a full marathon – that became a theme. 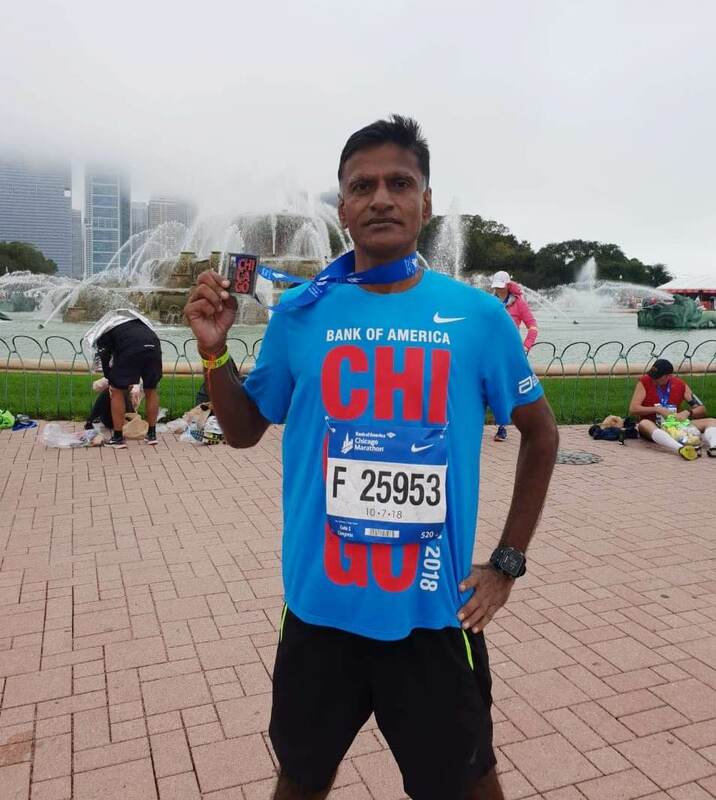 In three years we ran full marathons in five continents – Asia (Mumbai, Bangalore, Hyderabad, Dubai, Singapore), Europe (Salzburg, Prague), Australia (Melbourne), South Africa (Cape Town), North America (San Francisco) and finally on February 20, 2015, we achieved our dream of running a full marathon on all the seven continents. We finished the quest with Punta Arenas in Chile (South America) and the White Continent Marathon in King George Island, Antarctica. I also ran the Texas Metalsaw Marathon, Houston in the US, IDBI New Delhi Marathon, Tata Ultra Marathon (50K) and Comrades in South Africa. We were running for the sheer love of running without looking at our timing. Also there was no emphasis on speed training, strength training gym workouts etc. From December 2017, I joined Life Pacers and began a structured training program under the guidance of Dr Pravin Gaikwad, Dnyaneshwar (Don) Tidke and Panada. This training has helped. The result was visible in my personal best at the 2018 Tata Mumbai Marathon and 2018 Chicago Marathon. I was also able to complete my first Comrades Marathon of 90 kilometers in June 2018. I plan to run the London Marathon in April 2019 and Comrades Marathon for the second year in a row in June 2019. I am amazed when an entire city gets its stuff right to organize a race. Be it Chicago Marathon or Mumbai Marathon I always get goosebumps at the start line thinking about all the people who had to come together to put an event of such scale together. I was happy to see that the streets of Chicago were filled with people supporting runners from around the world. I saw people with the Indian flag at two different places. People were cheering all along the way. This has been a perfect race for me in terms of my performance, training, support etc. The aid stations were well-stocked and placed at just the right interval. I did better than my expectation. My training was for a 3:59 but I ended up with a 3:52:54. External factors might have affected (improved my performance) a bit. I had not planned for a cold and wet morning. Hence I had not packed enough dry clothes when I was heading to the start line. I have never run a race with so many runners racing the full marathon. So I had to wade through runners till the finish line. I did not know about the World Majors before I registered for Chicago a year ago. I knew that I would be in Chicago during the month of the marathon and decided to give it a try. Given a chance, I would love to do it again. I felt this was one of the best races I have run. Including the pre-race expo, the baggage counters, the starting corrals, the route and crowd support – everything was well planned and well executed. I would say this is a must run race for any runner. I started running in 2011. I have participated in Kaveri Trail Marathon, Mumbai Marathon, Bengaluru Marathon and Philadelphia Marathon among others. I plan to apply for the 2019 Berlin marathon. I wouldn’t be disappointed if I don’t get in. I run one race every year to have a timing certificate and to see where I stand. So I would definitely be running a local race if not a major one. I started running six years ago at the age of 44. I have run many 10 kilometer runs, half marathons and full marathons. I also ran three ultras. Doing World Majors was never on my mind, but I registered for Chicago while training for Comrades this February; I was getting a bib. I started training in August and had just two months to prepare for the race. I had heard that it’s a very good race with good weather and flat course. I thought I would train to whatever level I can as per my capability in the two months I had and just go and enjoy my first major. 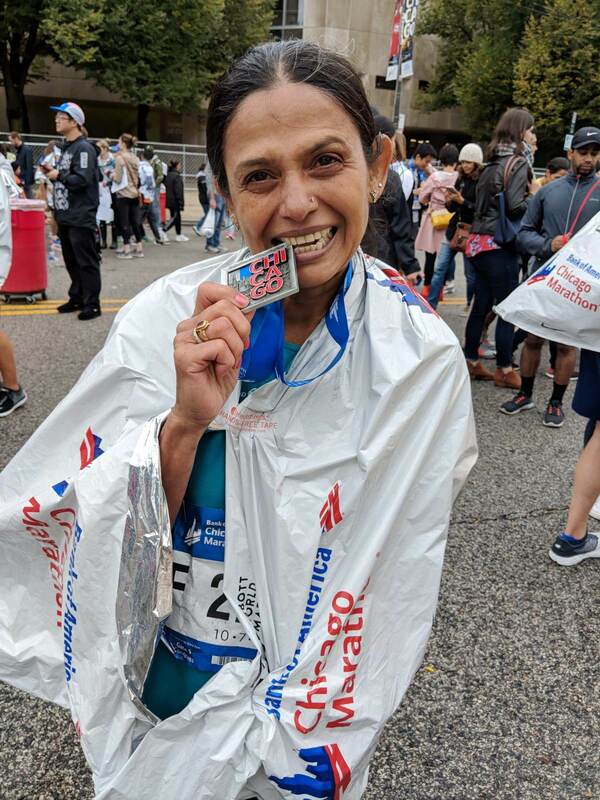 Though I was a little apprehensive about running in a crowd of close to 50,000 runners and in a slightly cold and rainy ambiance on race day, it turned out to be a fantastic experience for me. I ended up with a personal best. All arrangements right from the bib collection to getting to the start line, to aid stations on the course, to crowd support, to crossing the finish line and collecting our medals and refreshment bags – everything was superb. All arrangements were made keeping runners as the first priority and to make them feel special. The race T-shirt and the medal are very good. Even three days after the race, people congratulated any runner they came across on the streets wearing the race T-shirt or medals. This was such a fabulous experience for me that now I am tempted to run all the six World Majors. Some of the major events I have participated in are Ladakh Marathon, Run the Rann, two Comrades Marathons back to back in 2017 and 2018 and Tata Ultra Lonavala. The latest one was Chicago Marathon. Well for now its recovery time. I will soon be back to training to get ready for the Tata Mumbai Marathon and then Two Oceans in April 2019 in South Africa. The race was really good and unlike any marathon in India the crowd support was wonderful right from the first kilometer to the finish line. You could not have asked for anything more. Weather was good maybe a bit cold but I had no complaints. It also rained for a while. I entered this race because my daughter lives in Chicago. Of course, this was one of the races in my bucket list. As regards timing it was below my expectation. I had to take a break and that led to the poor timing. The first half of the run was as per plan. Overall I enjoyed the run. It was a different experience to see tens of thousands of runners running non-stop. Next on the cards is Comrades Marathon. But that will be considered only when I improve my timing. I have been running for 15 years now. I ran the Chicago Marathon just two weeks after the Atlantic City Half Ironman. It more than compensated for the disappointment I experienced at Atlantic City where unfortunately I had a DNF (Did Not Finish). During the cycling segment I missed the third loop and found myself exiting the cycling course without completing the distance. Nevertheless, I continued and finished the running leg of the triathlon. Two weeks later at Chicago I had an excellent run. At Chicago I ended up with a personal best of 4:20:29 hours, shaving off 16 minutes from my previous personal best. It was an awesome experience with much cheering. My next event is a half Ironman distance triathlon at Kolhapur. That will be followed by a full marathon at the Ahmedabad Marathon in November. Chicago was a wonderful experience. It was my fourth World Marathon Major. When I landed in Chicago the weather was warm. But gradually it changed and it was for the better. On race day the weather was cold and rainy; there was intermittent rain throughout the run. I had struggled with my earlier runs in London and New Zealand. Hence my coach Suchita and I worked hard on hip opening and lot of exercising of the legs. I put in much effort like taking care of food, exercise, rest, mileage. Chicago marathon was a beautiful experience. There were so many volunteers. There was plenty of water and Gatorade. The crowd support was tremendous and the cheering, loud. The route was beautiful. There were so many runners. There was never a moment when I was running alone and never a moment when I felt I should walk or stop. I missed my family a lot when I finished the race. It’s because of the support from my husband and daughter that I am able to do all these races. I would truly love to do Chicago and Berlin again because they made me feel good about myself. I would love to do London again because I am sad about the result I got and given I love the city, I would like to do justice to my run. I will be running New York in November.